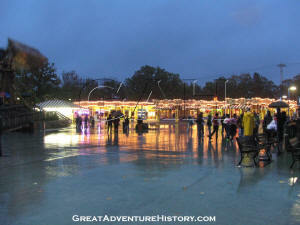 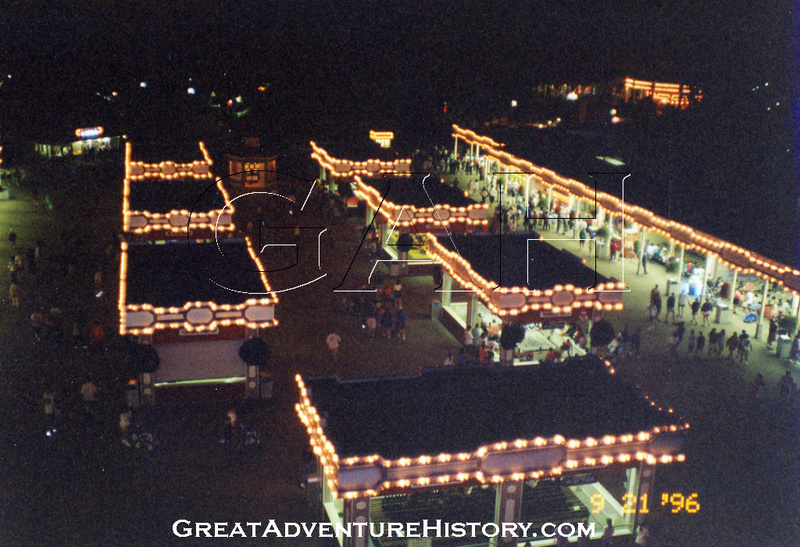 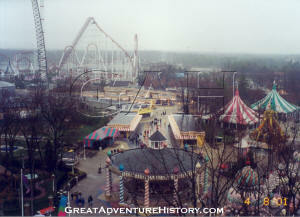 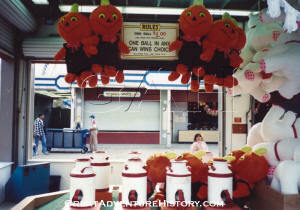 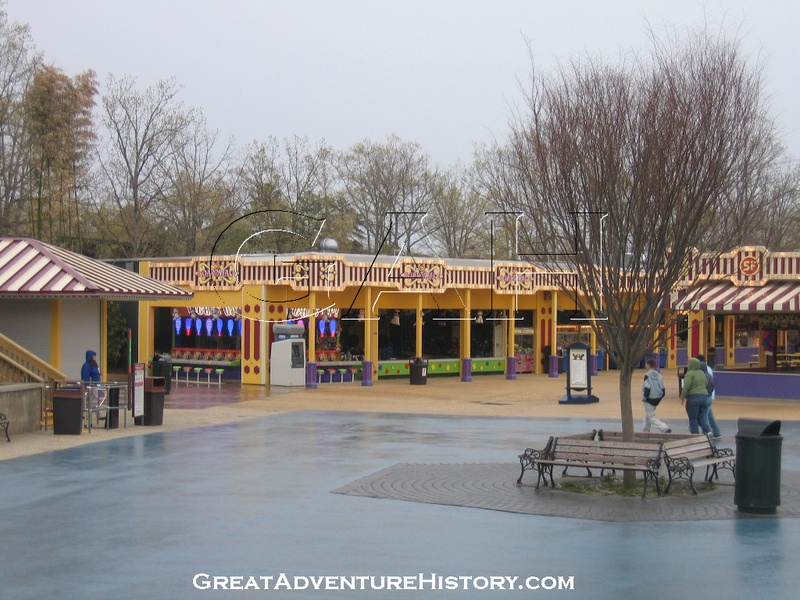 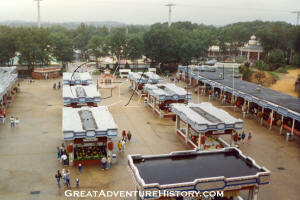 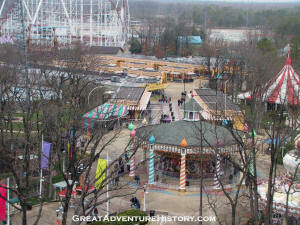 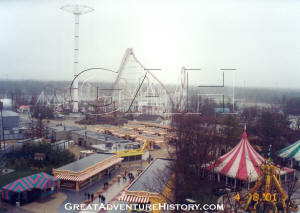 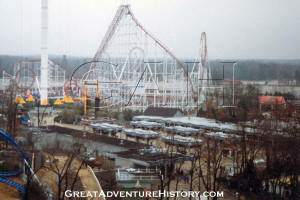 After being destroyed by a fire in December 1981, the park's main games area known as Fortune Festival was rebuilt during the winter of 1981/1982 and reopened as Goodtime Alley. 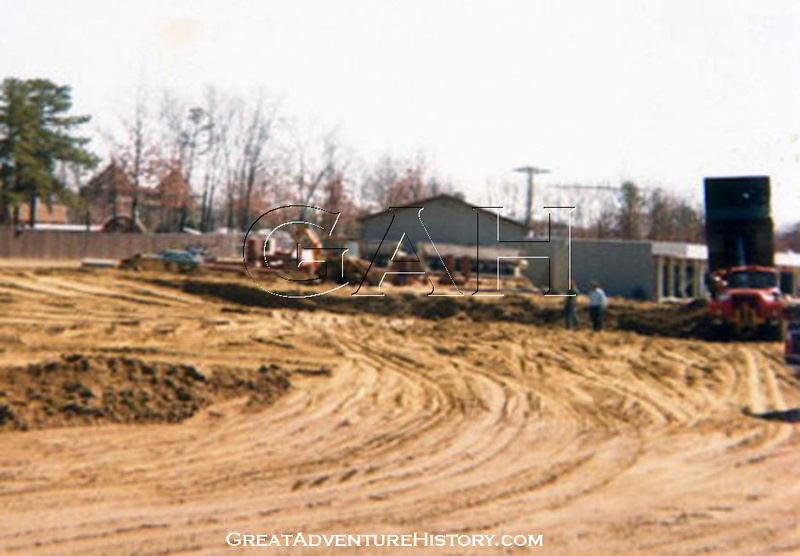 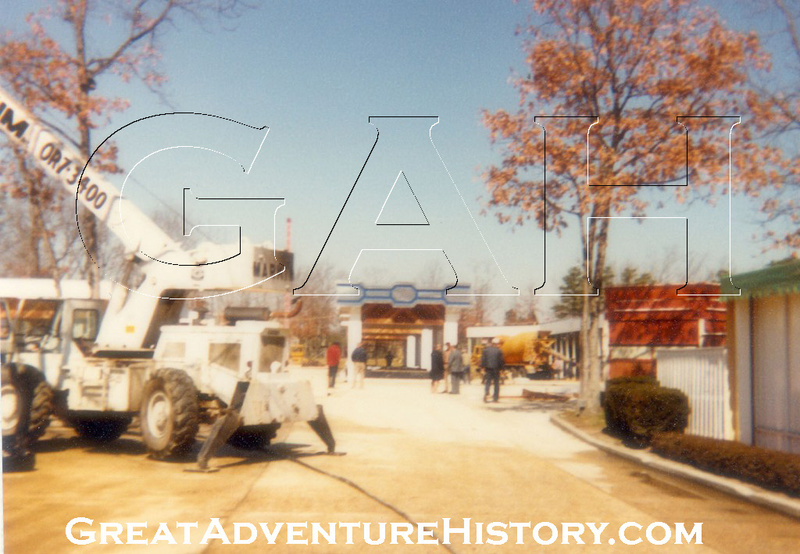 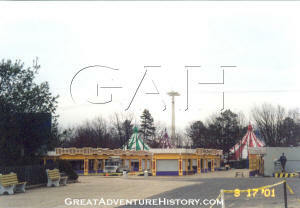 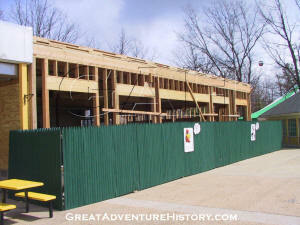 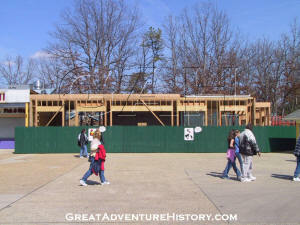 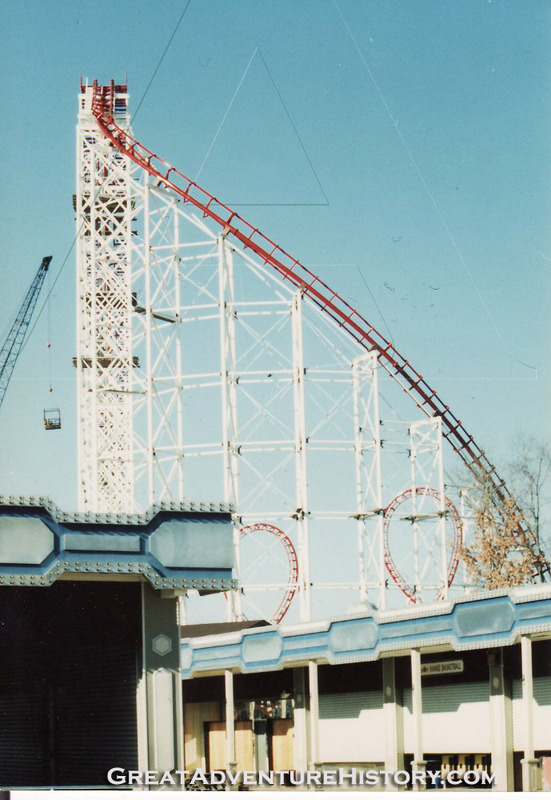 After the original games area was destroyed by fire in December of 1981, plans quickly came together and construction began on a new and improved section for the 1982 season. 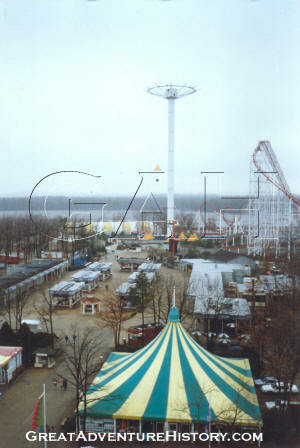 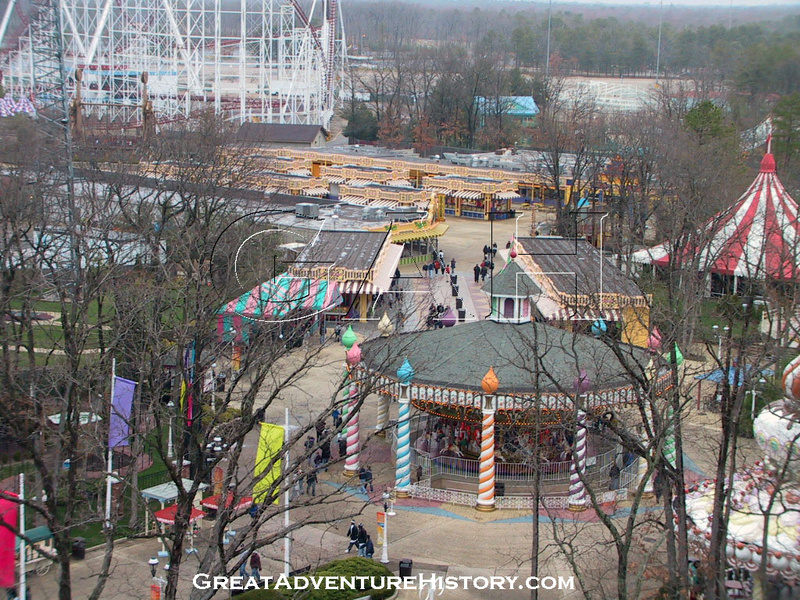 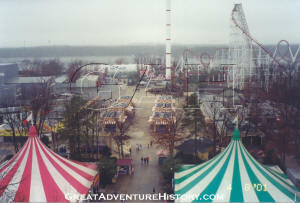 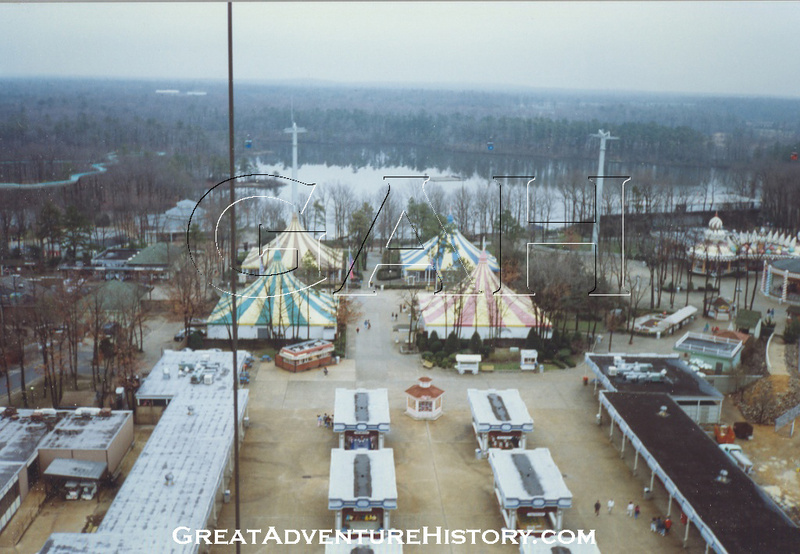 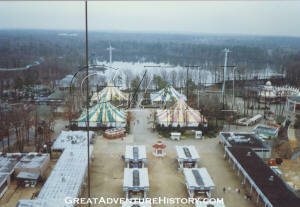 In spring of 1982, the area was still a work in progress, with carpenters and electricians working feverishly to complete the new buildings and get them open for the season. 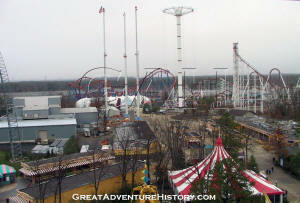 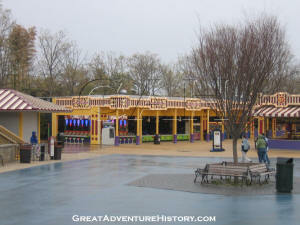 The new Goodtime Alley offered a great improvement over the original, with an eye towards future expansion. Unlike the original which was a dead end, the top end was left open for additional attractions. To help draw crowds into the area, rides would be added. 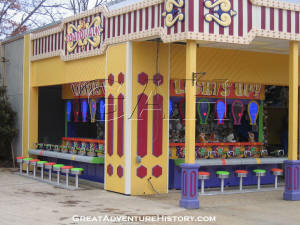 Joust-A-Bout was added in 1982, and its colorful lights, height and motion were a draw and a complement to the lights and sounds of the neighboring games. 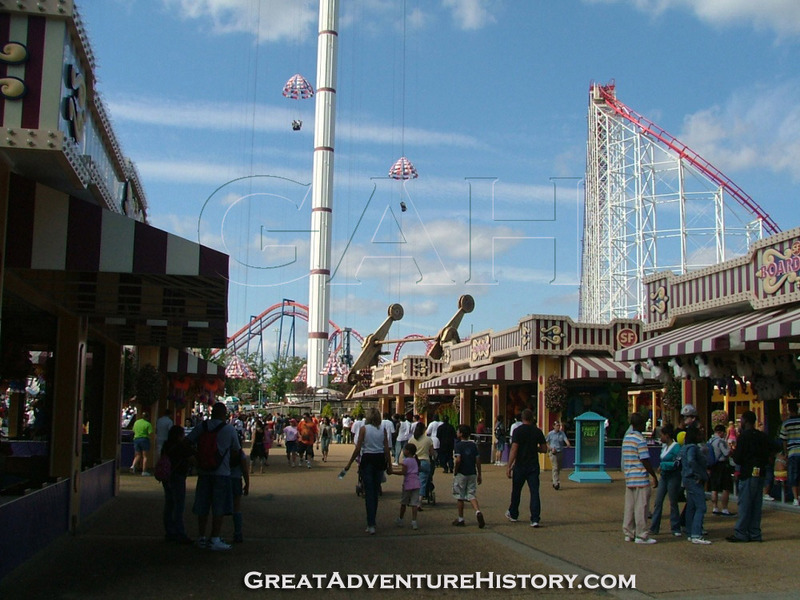 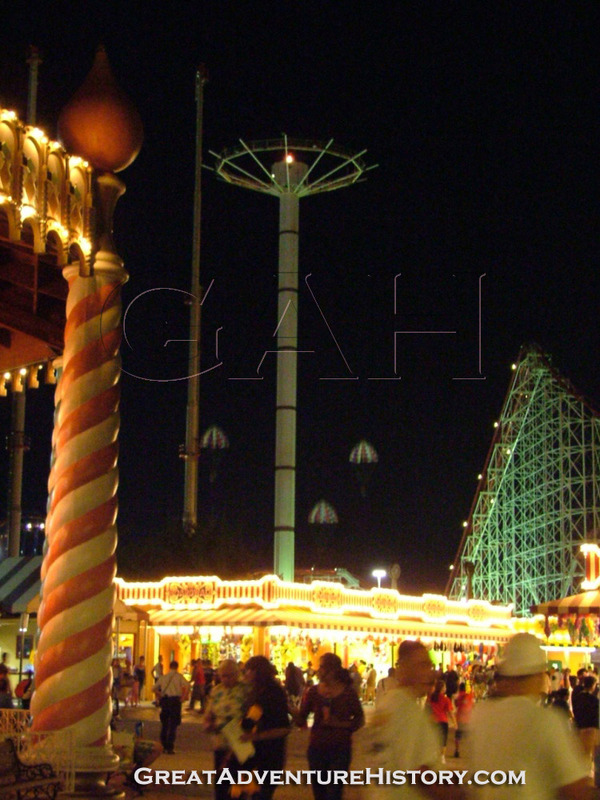 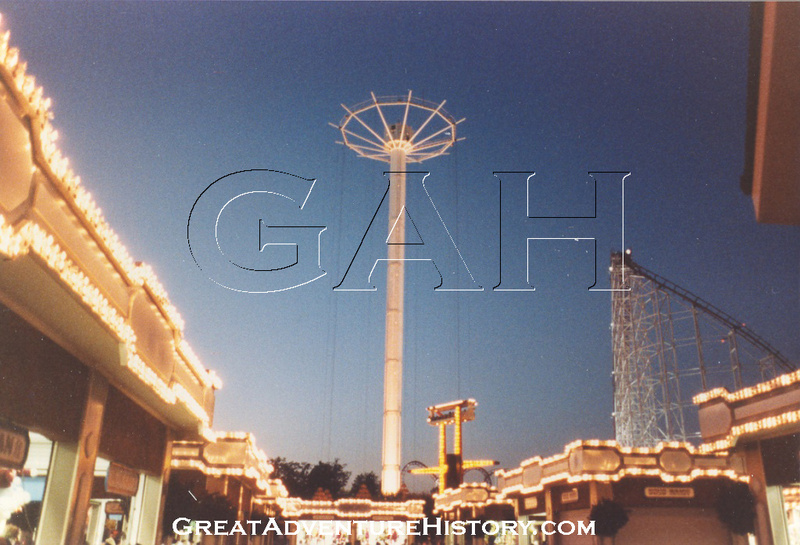 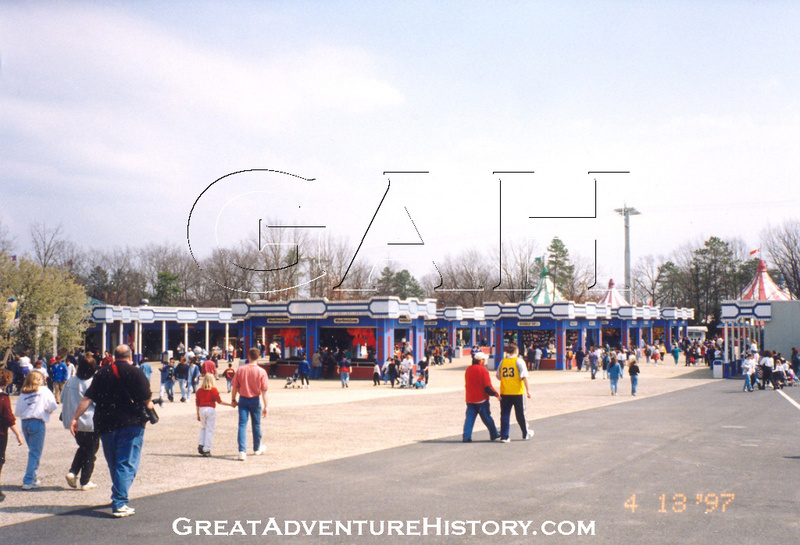 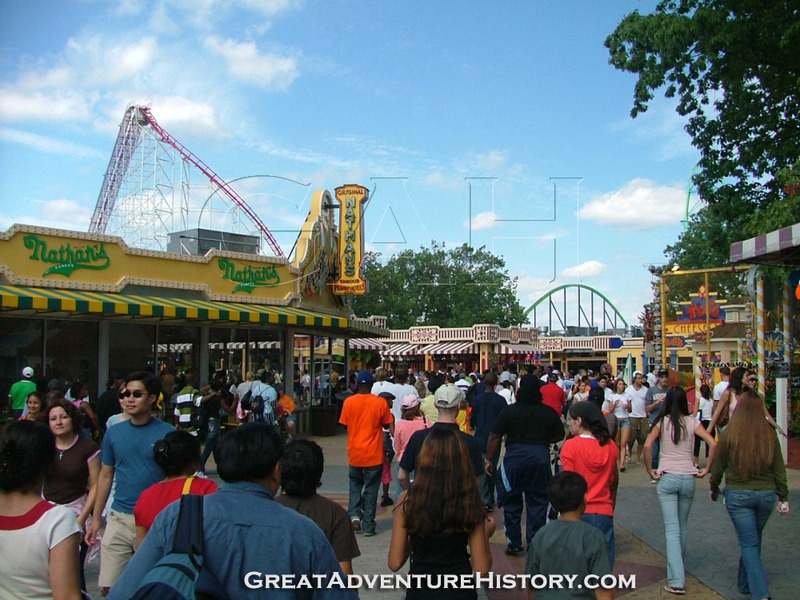 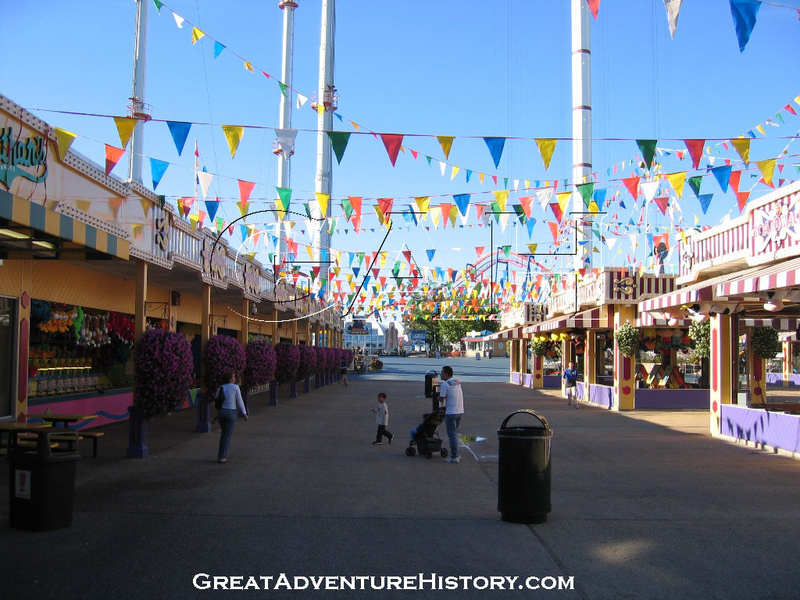 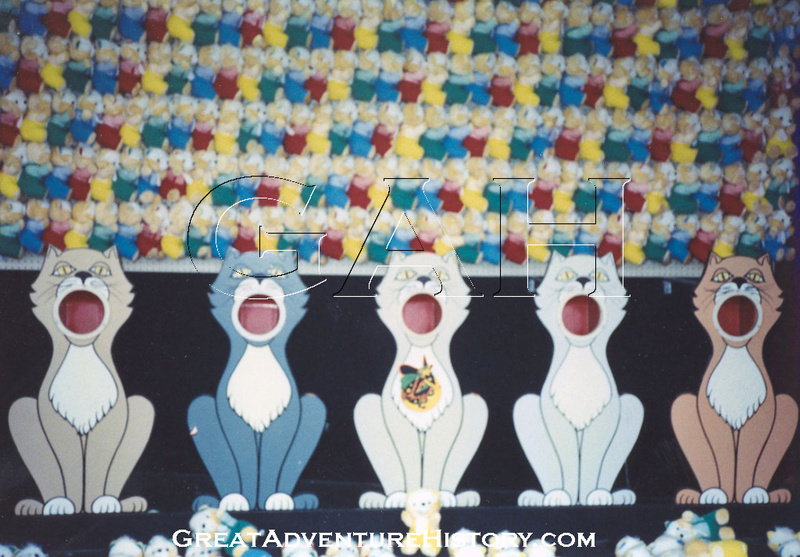 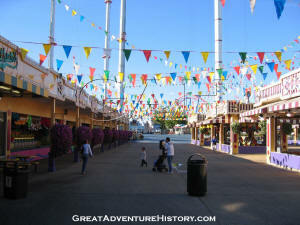 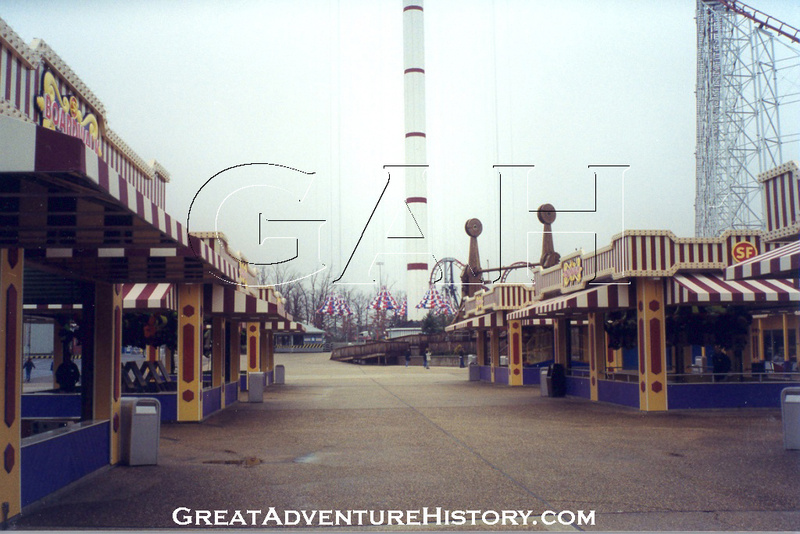 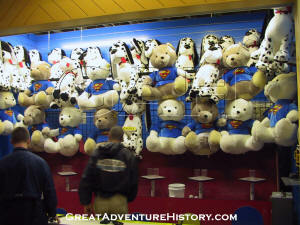 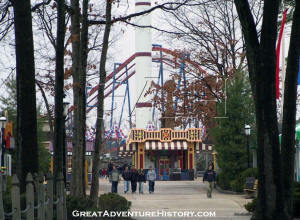 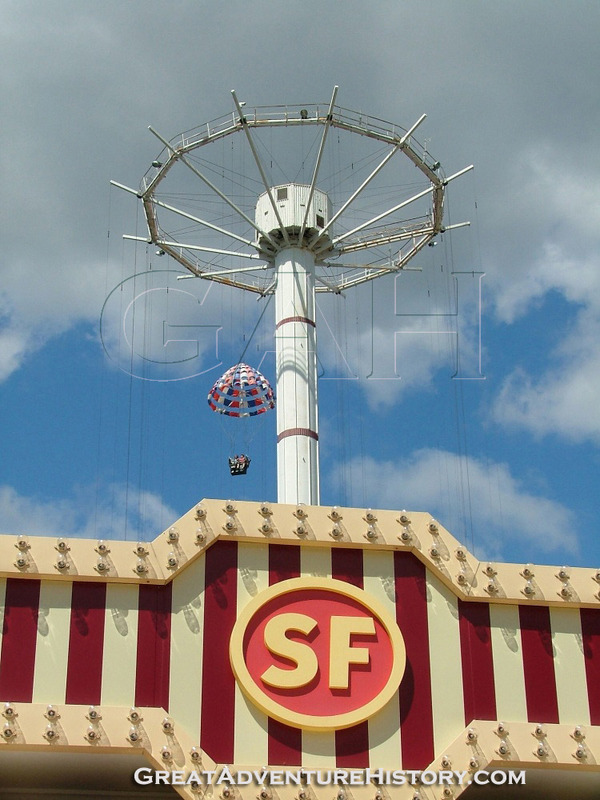 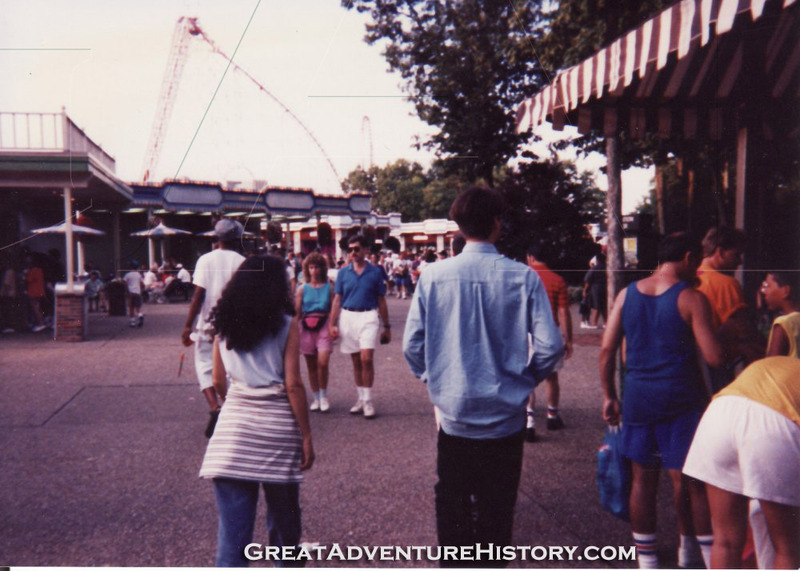 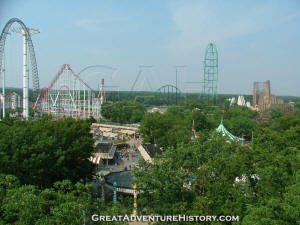 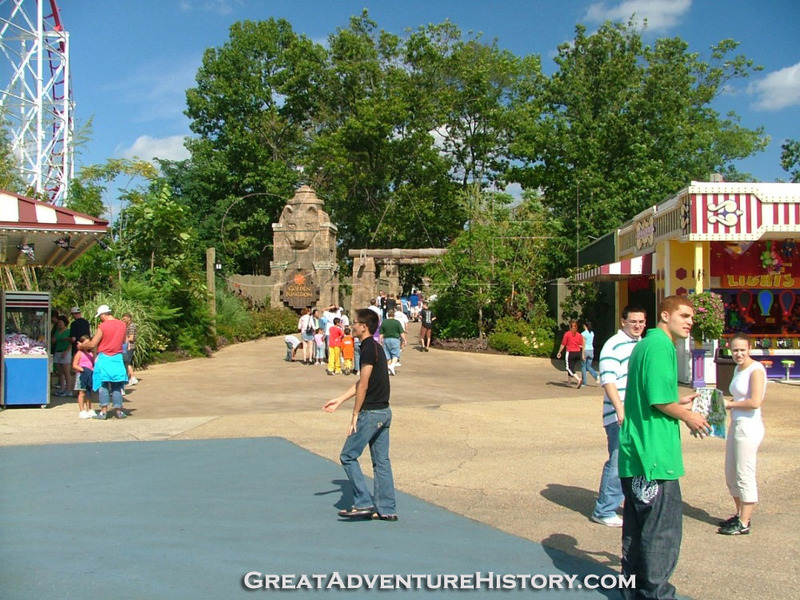 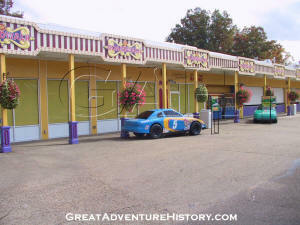 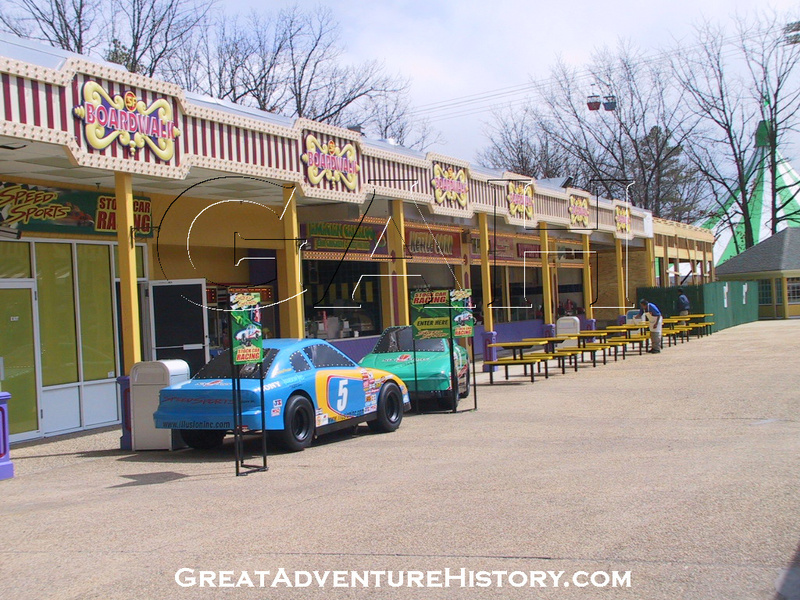 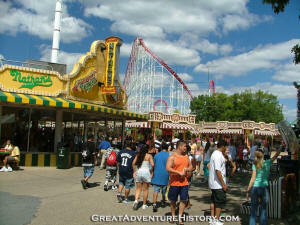 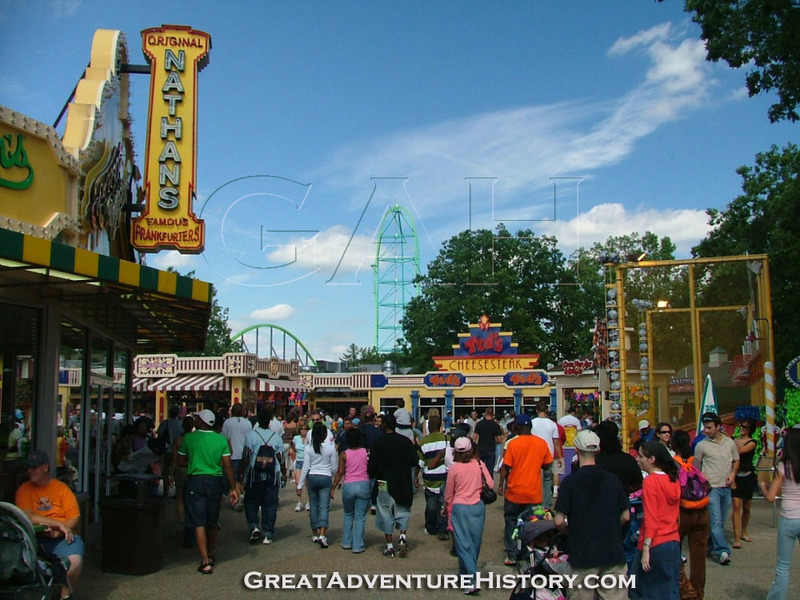 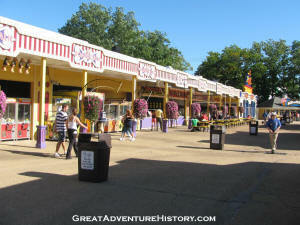 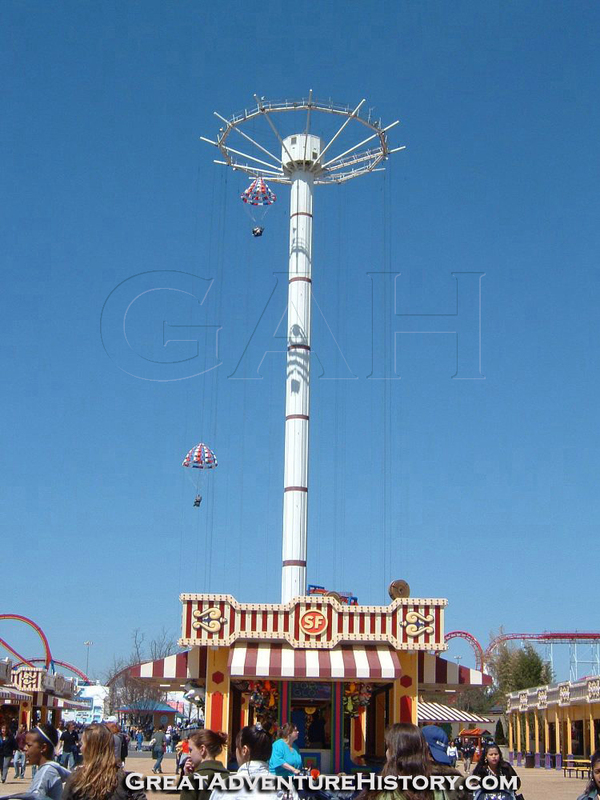 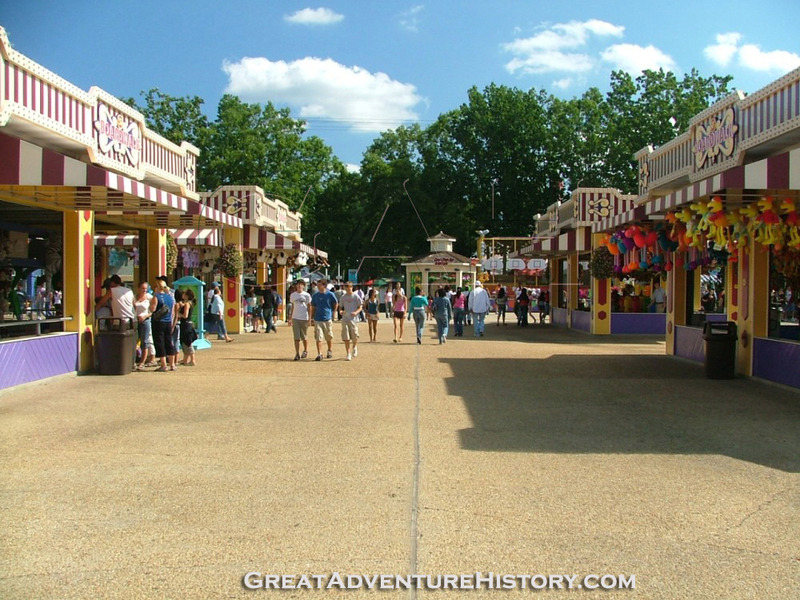 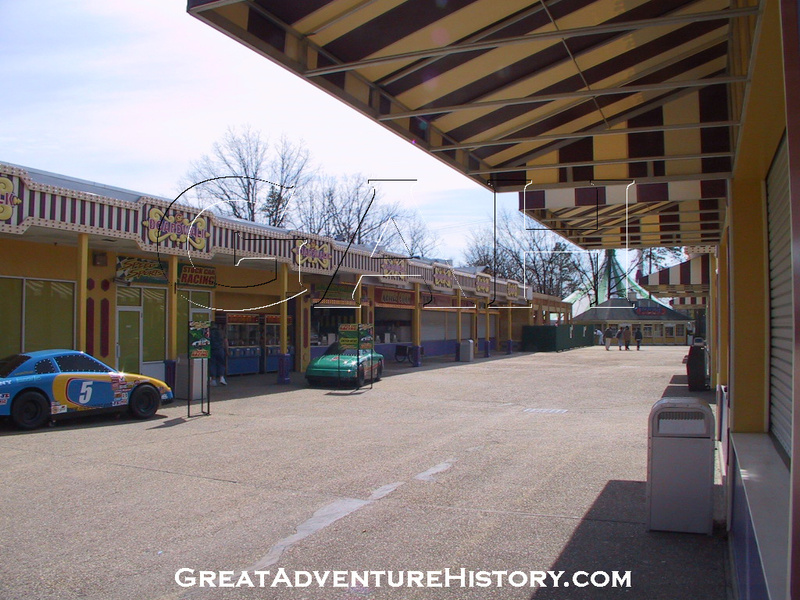 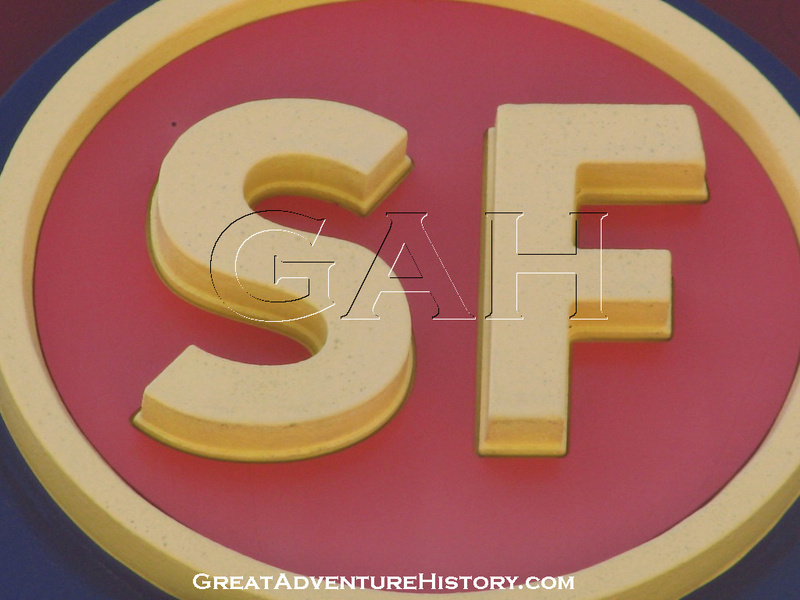 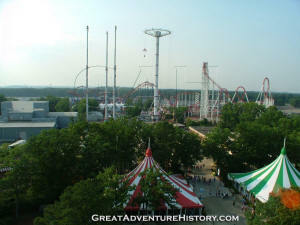 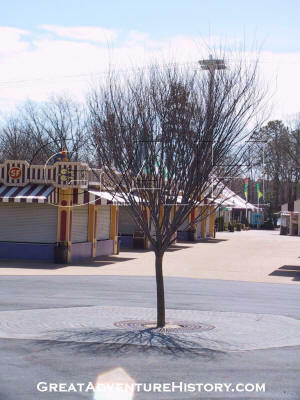 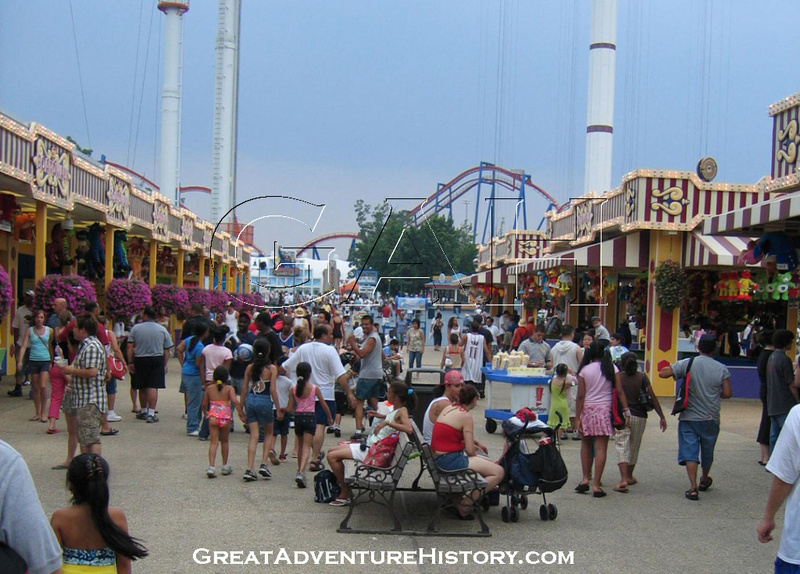 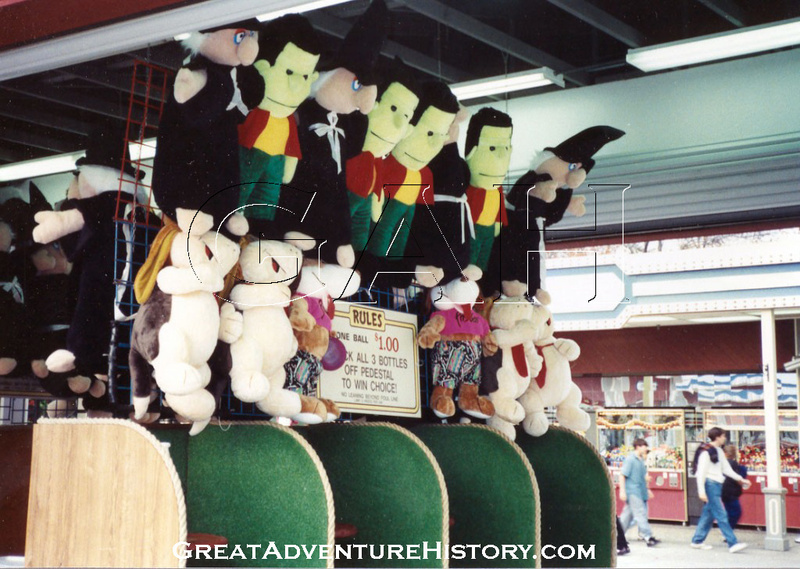 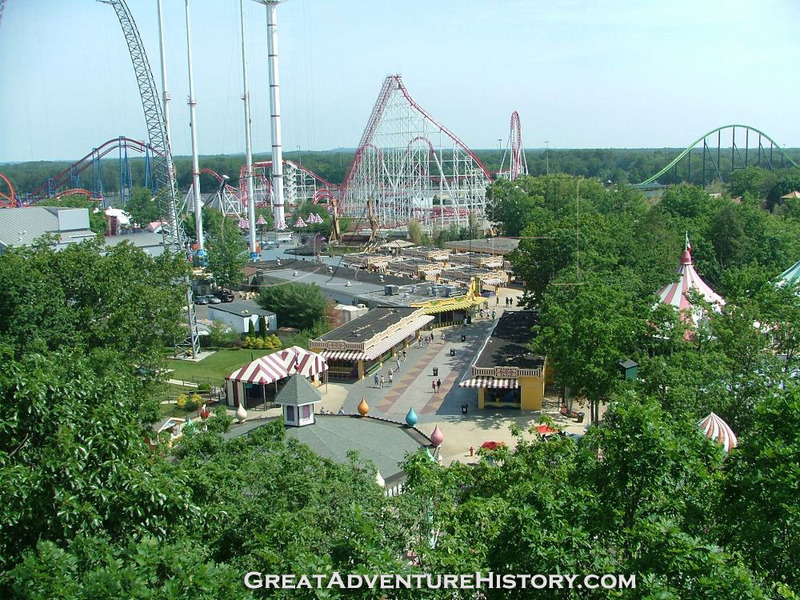 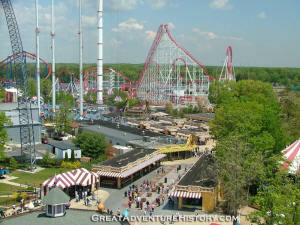 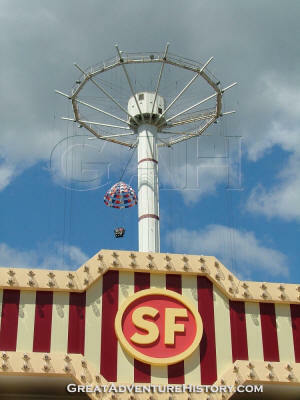 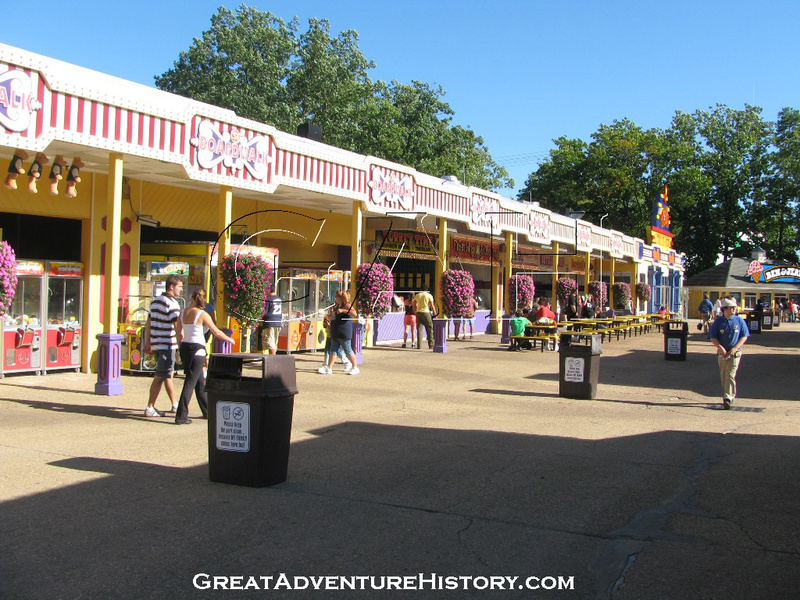 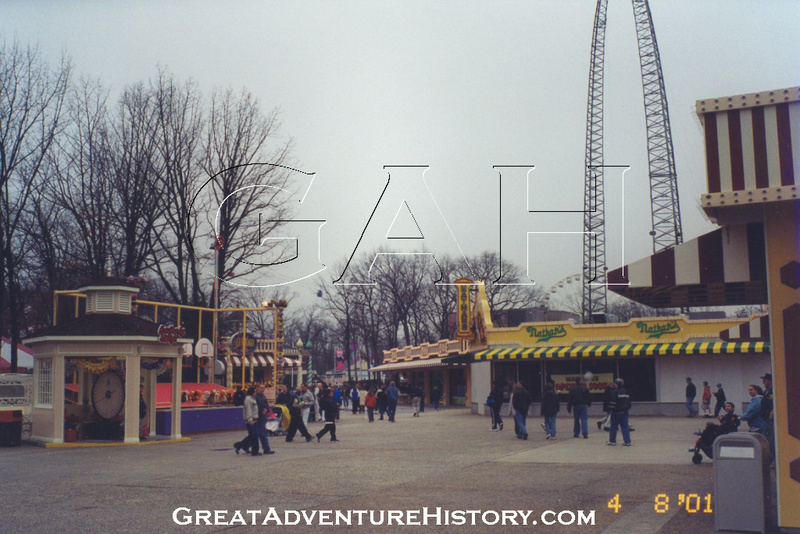 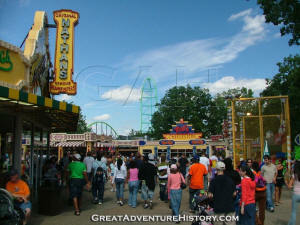 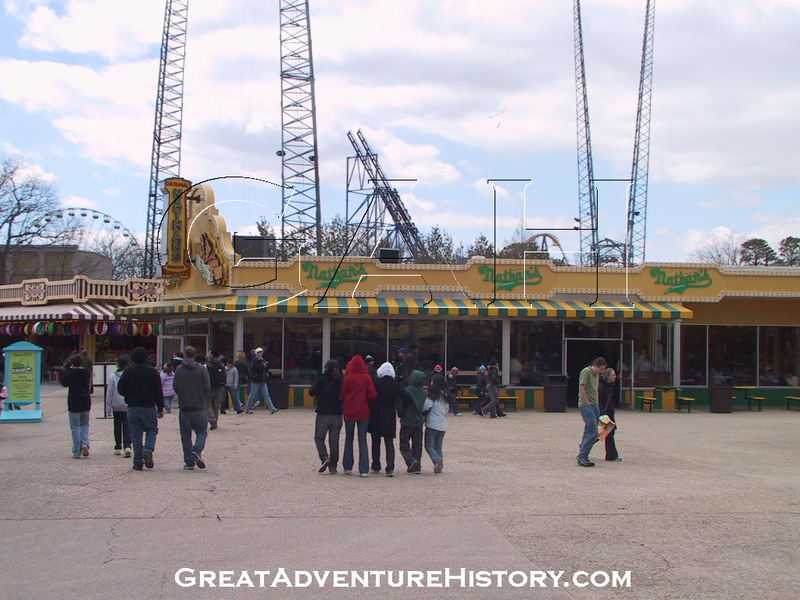 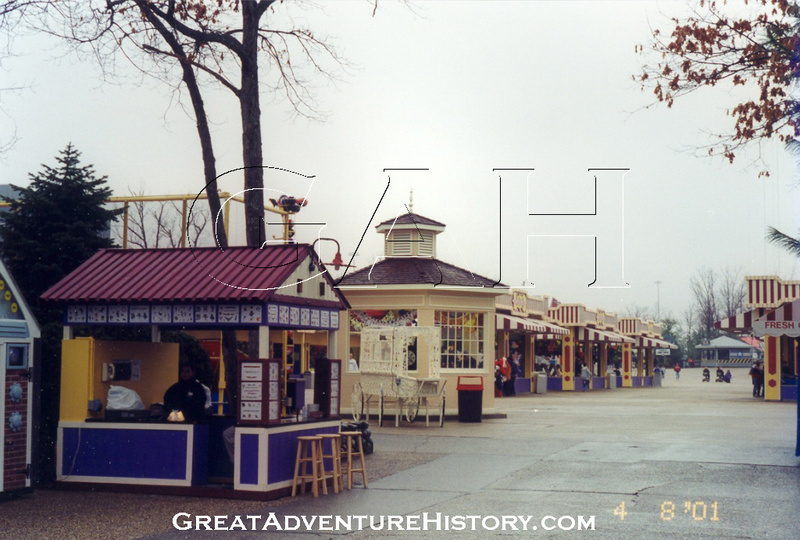 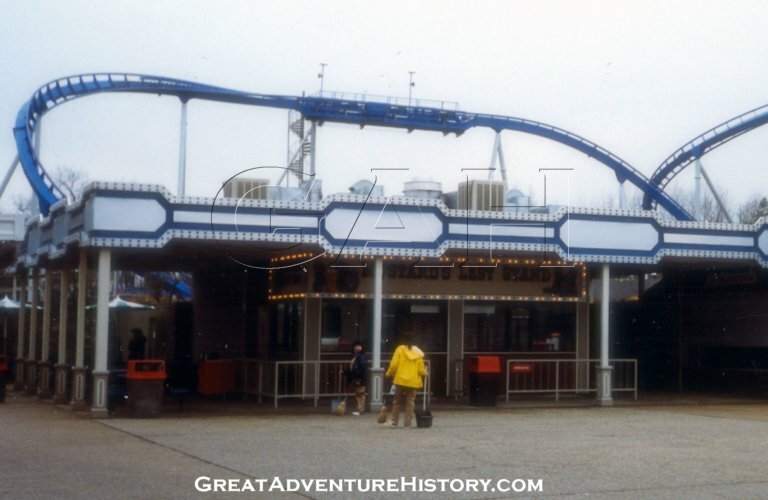 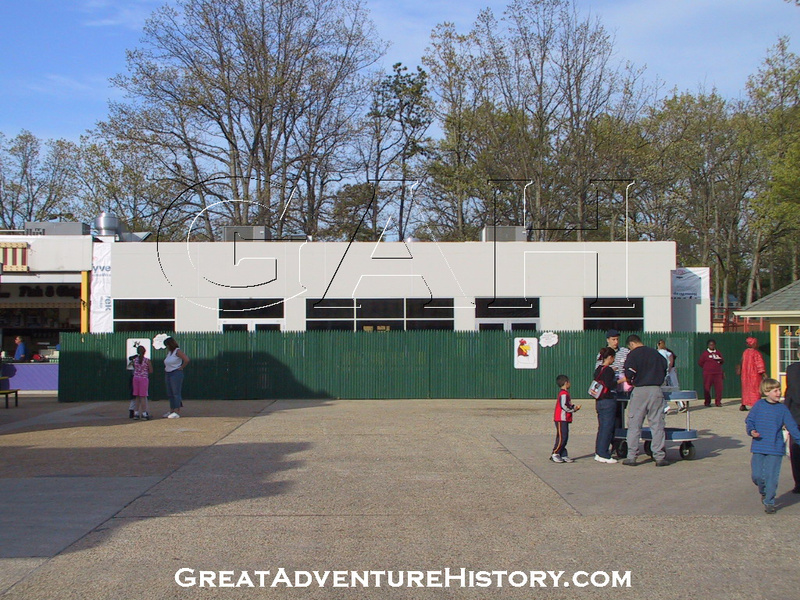 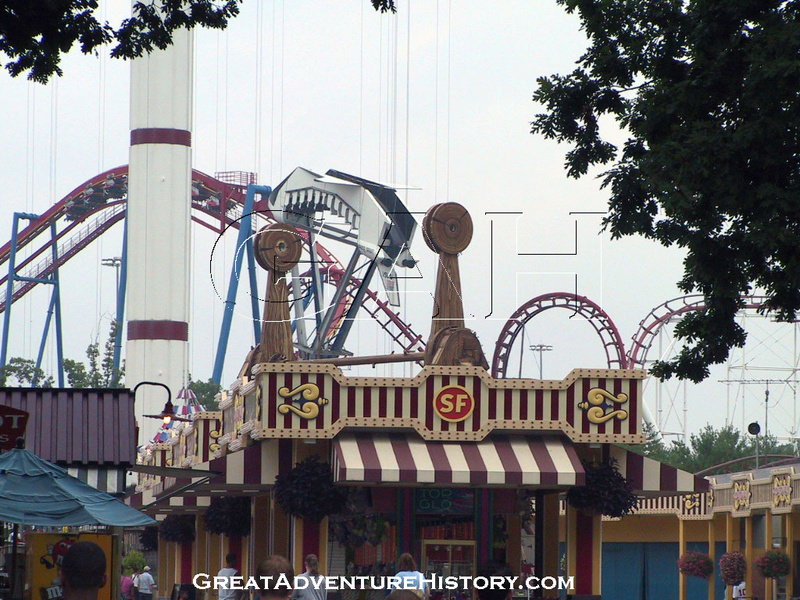 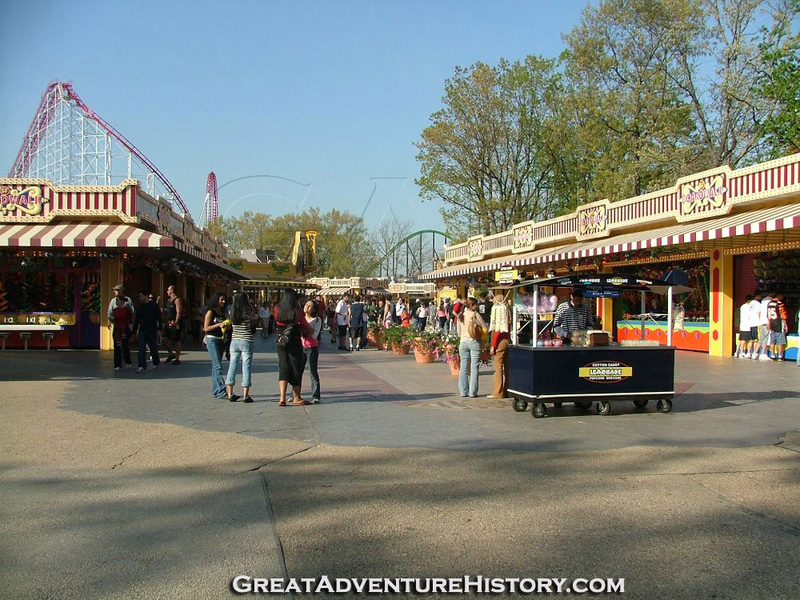 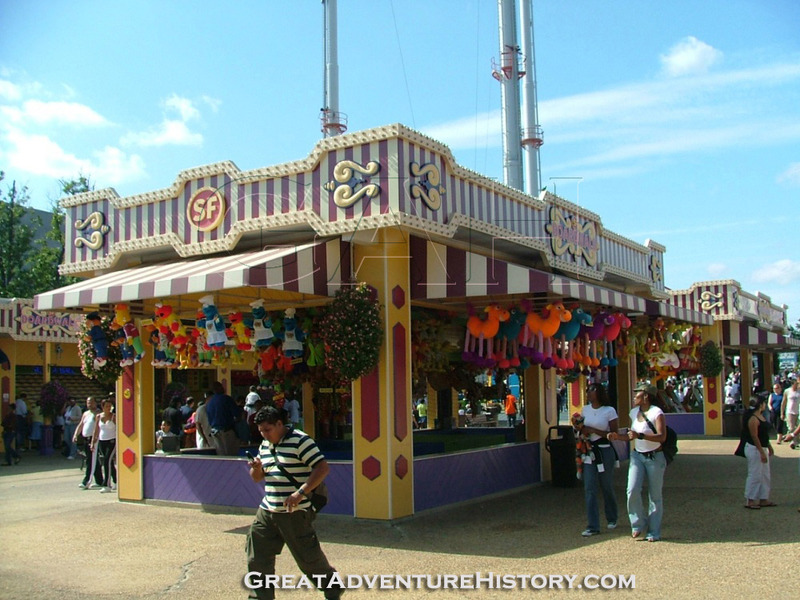 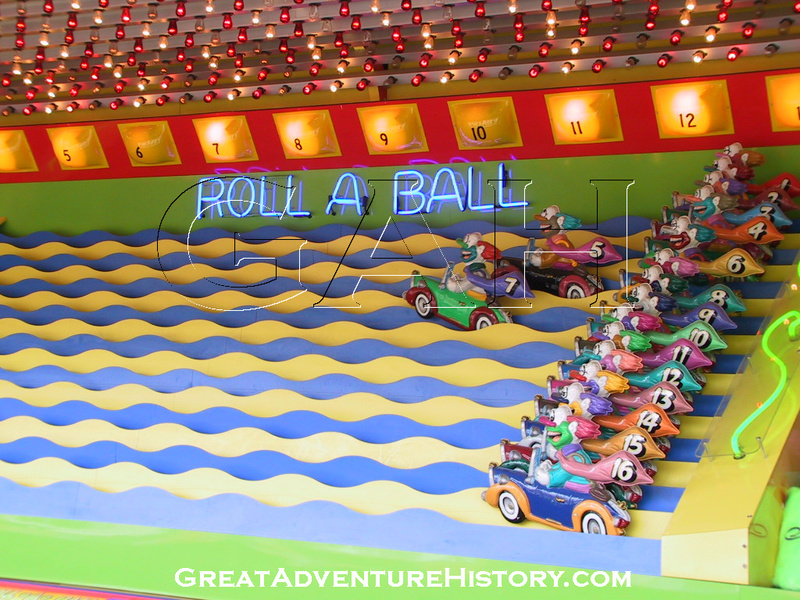 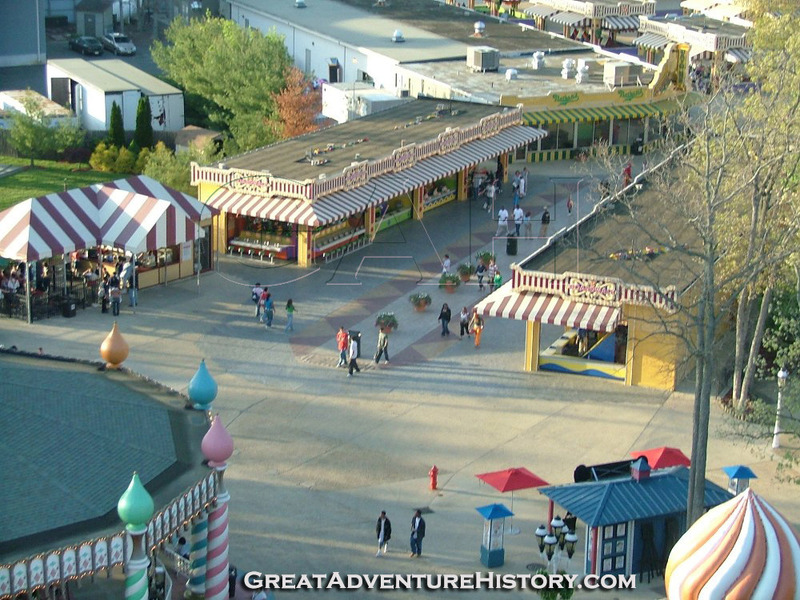 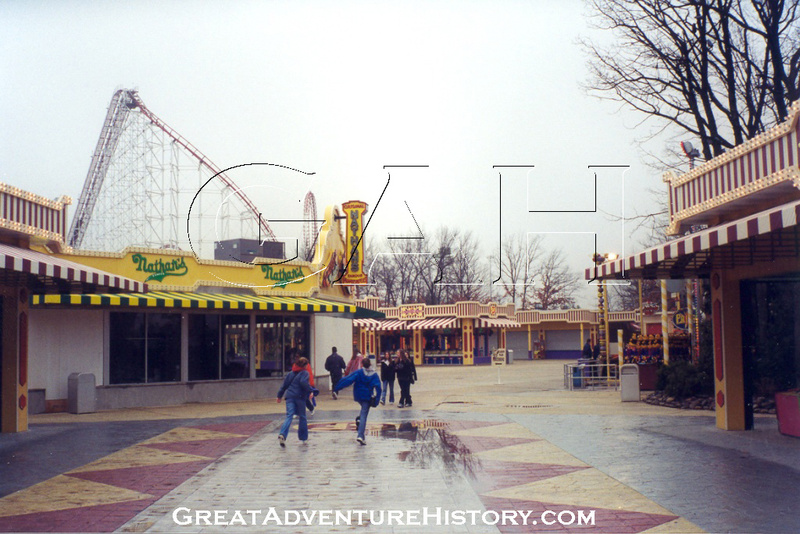 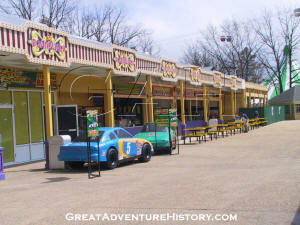 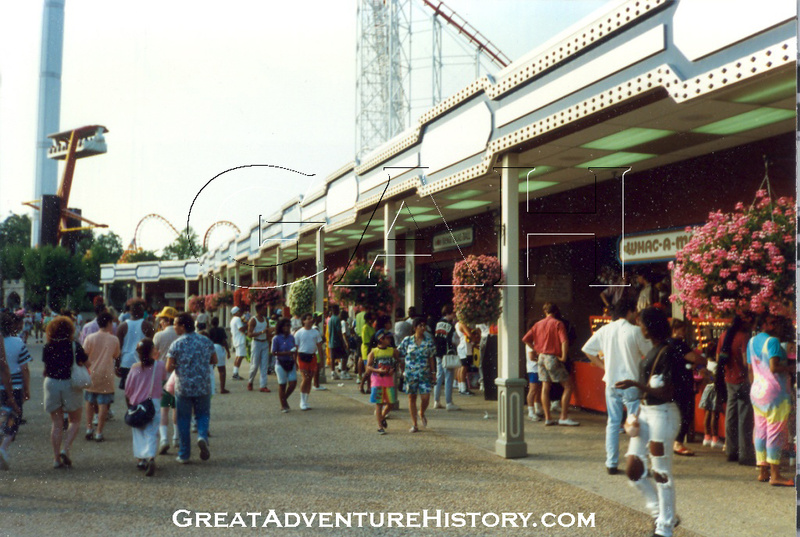 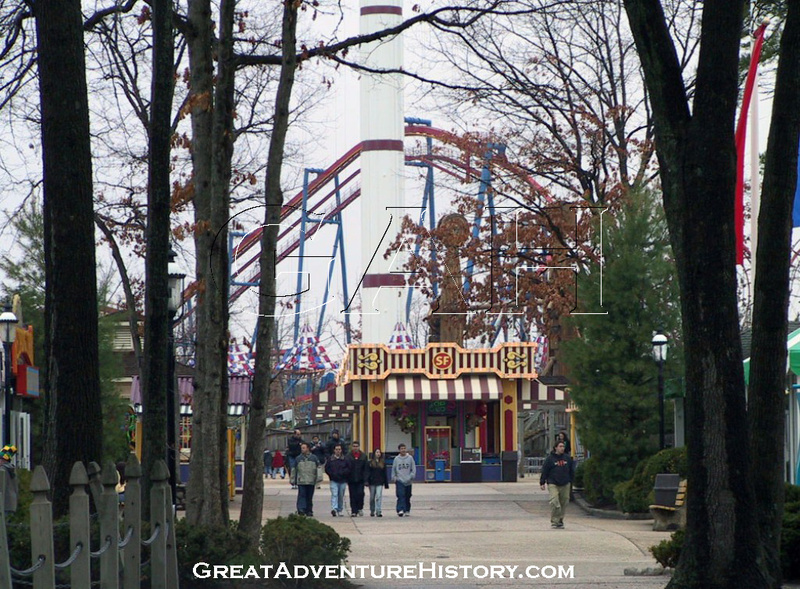 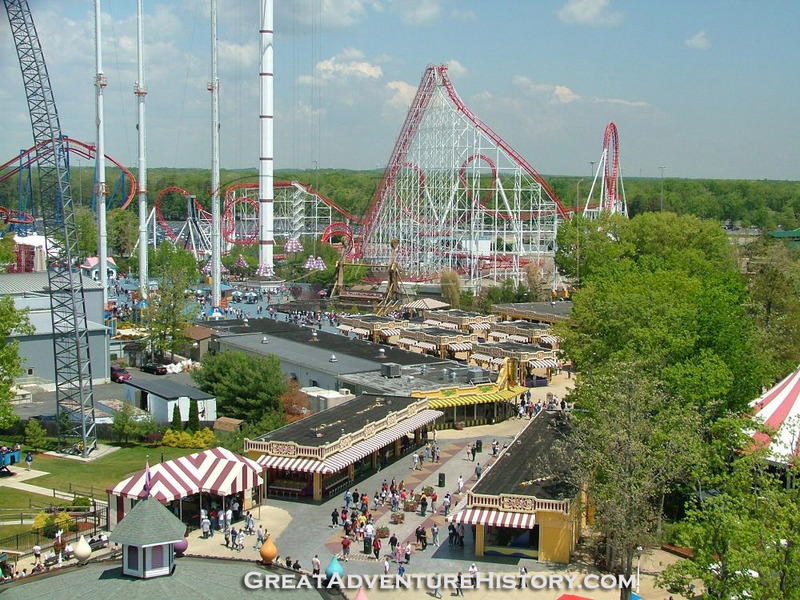 At the time of the construction of the new Goodtime Alley, Six Flags was owned by Bally Corporation, and the company was making money in the casino and games business as well as theme parks. 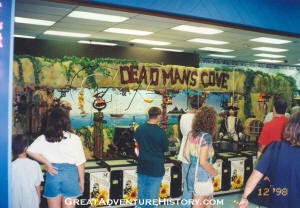 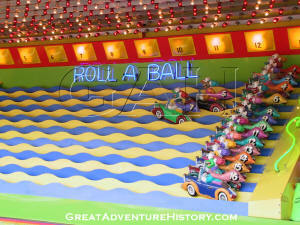 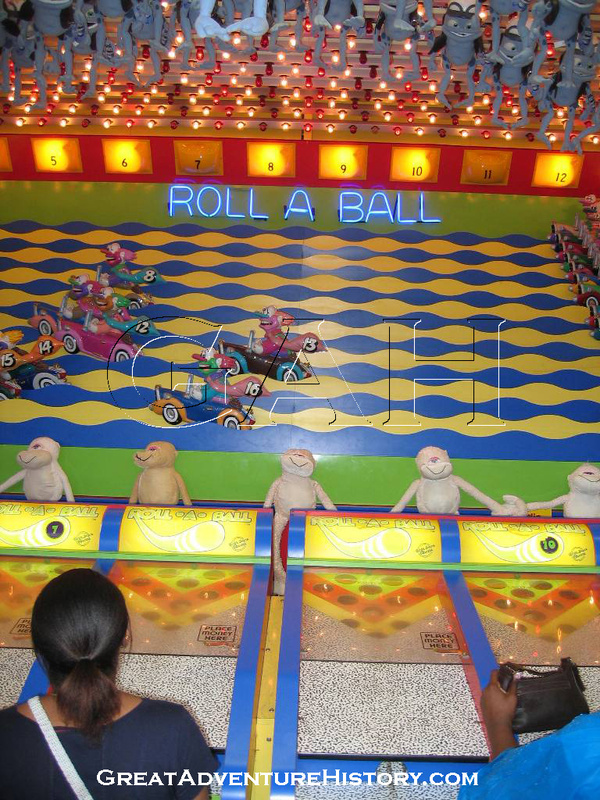 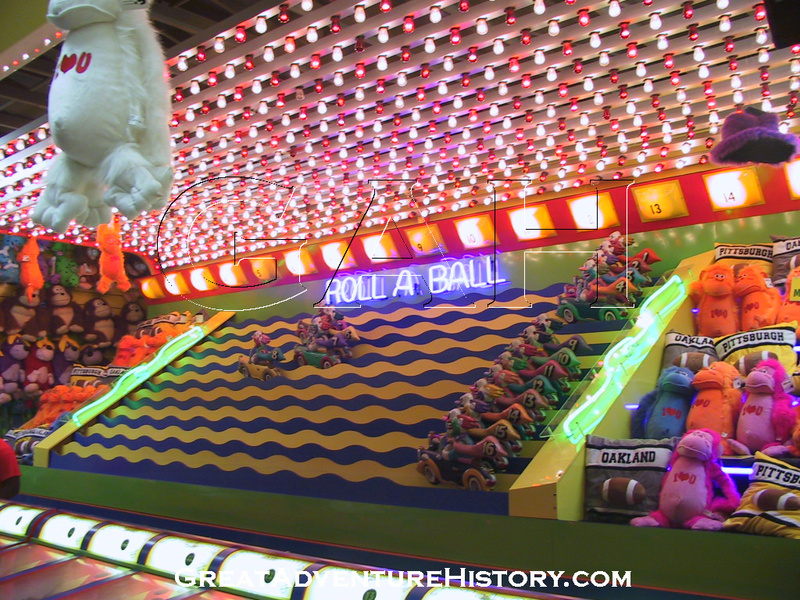 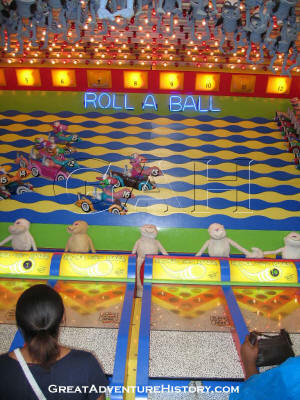 Games became a major emphasis and money maker for the parks, and Bally's own games were featured throughout. 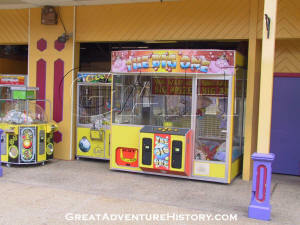 The big game at the time was Pac Man, and it owned by Bally, so Pac Man and other arcade games were found throughout the park, including the new Goodtime Alley. 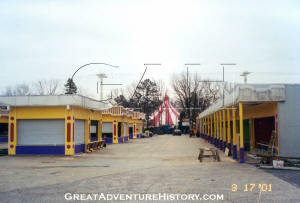 The original configuration of the games area featured two long buildings flanking the sides, with a set of six free-standing games in the center. 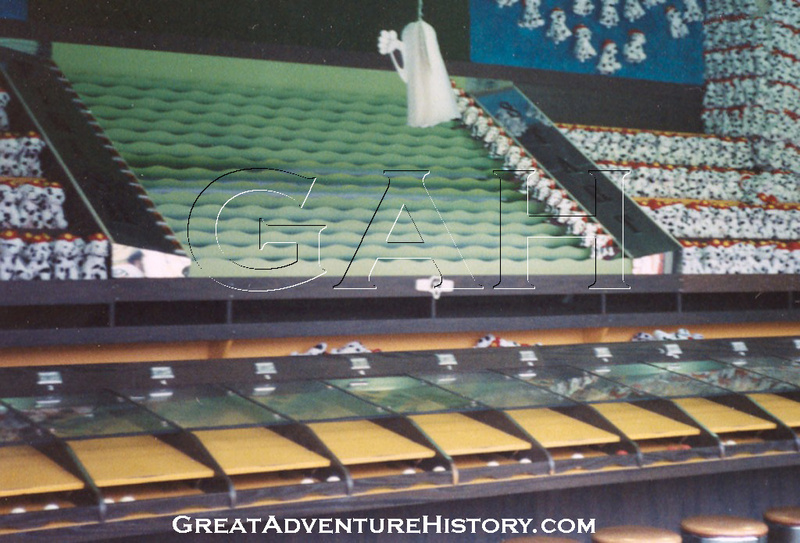 In 1988, a seventh free standing game was added, centered at the top end of the section, and an octagonal Guess Your Weight stand was added in the center of the lower end. 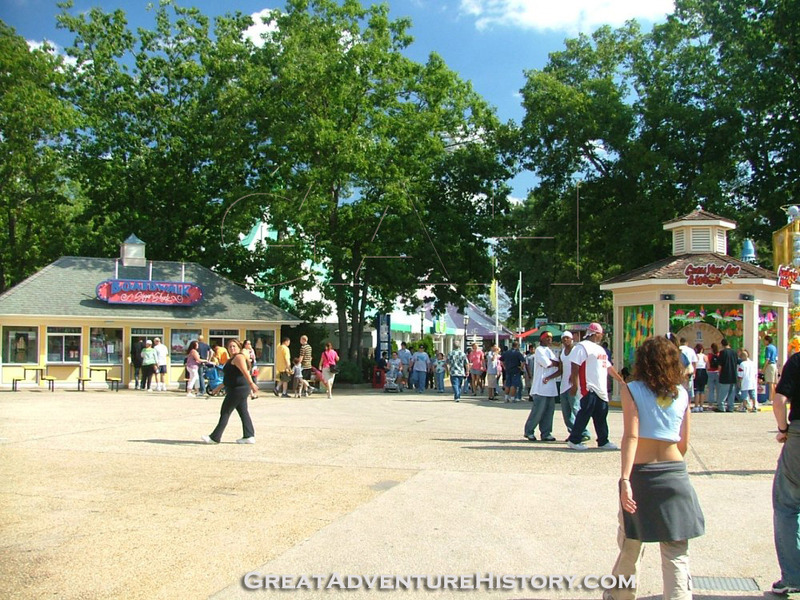 The lower end of the area, closest to the Four Tents featured two restaurants. 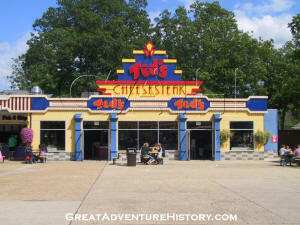 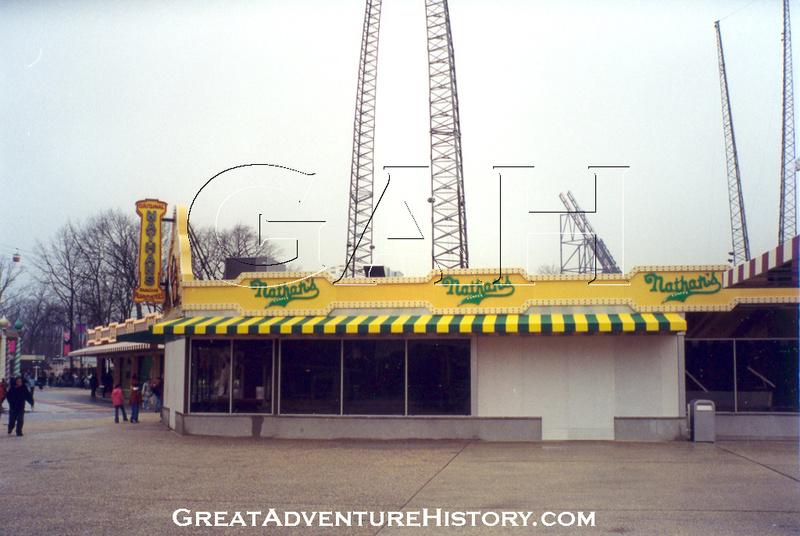 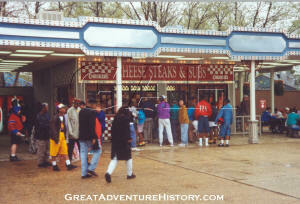 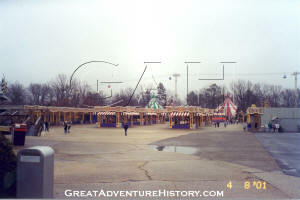 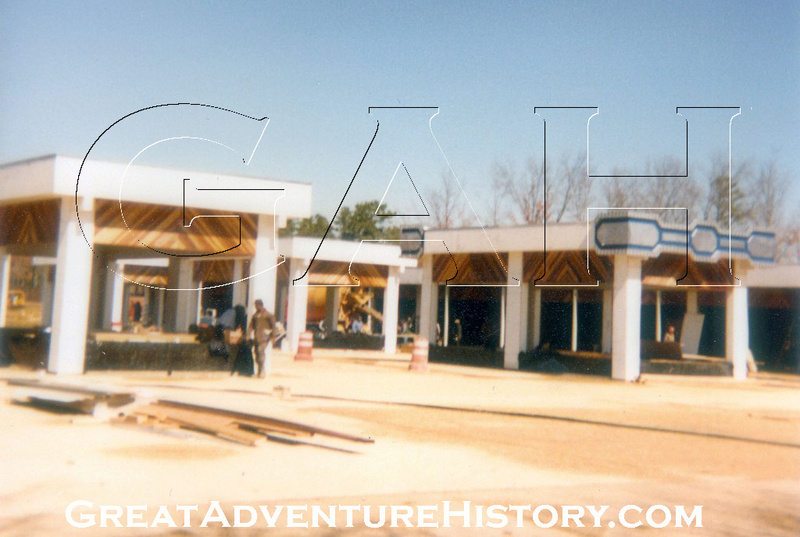 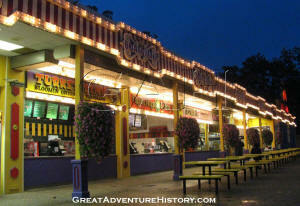 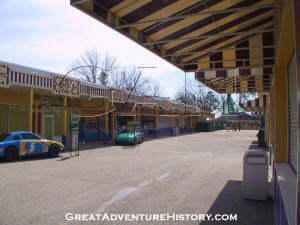 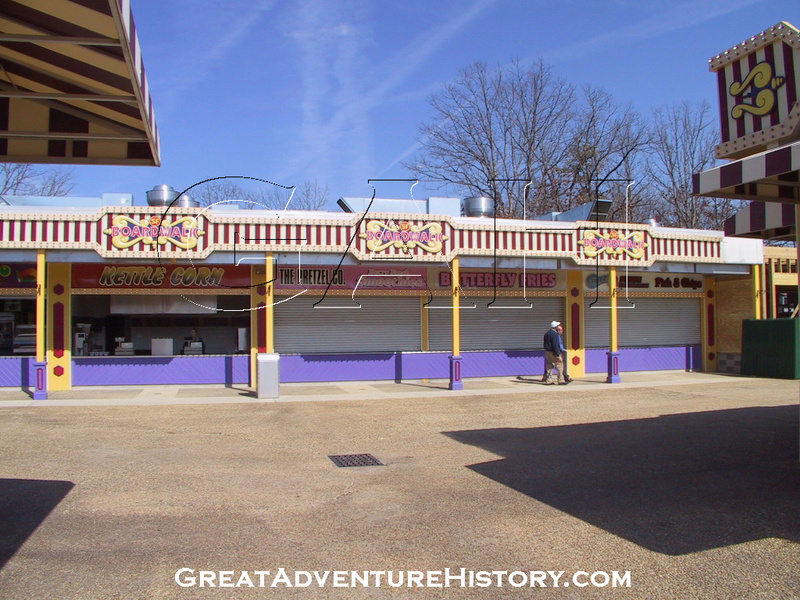 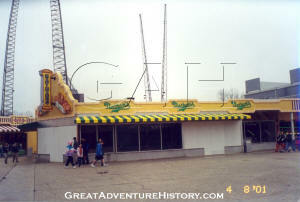 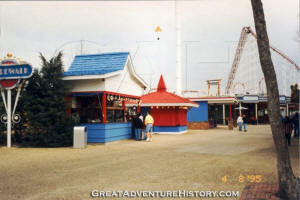 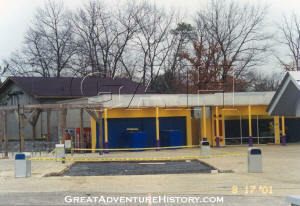 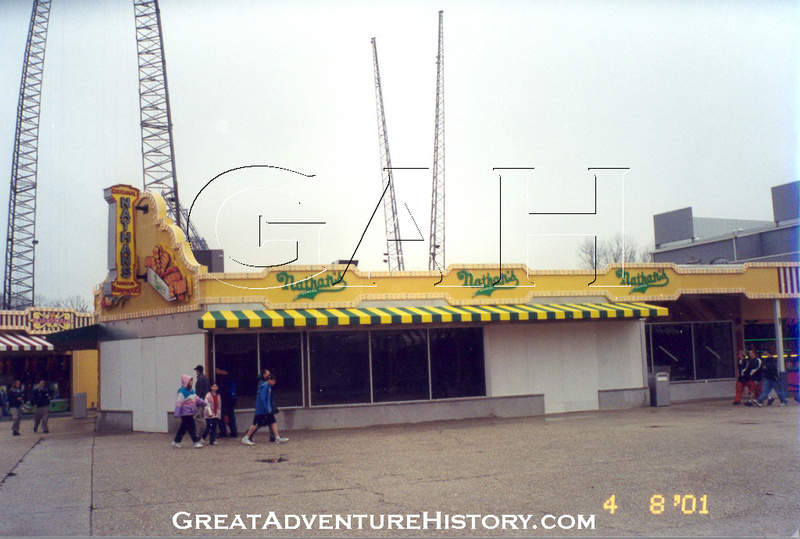 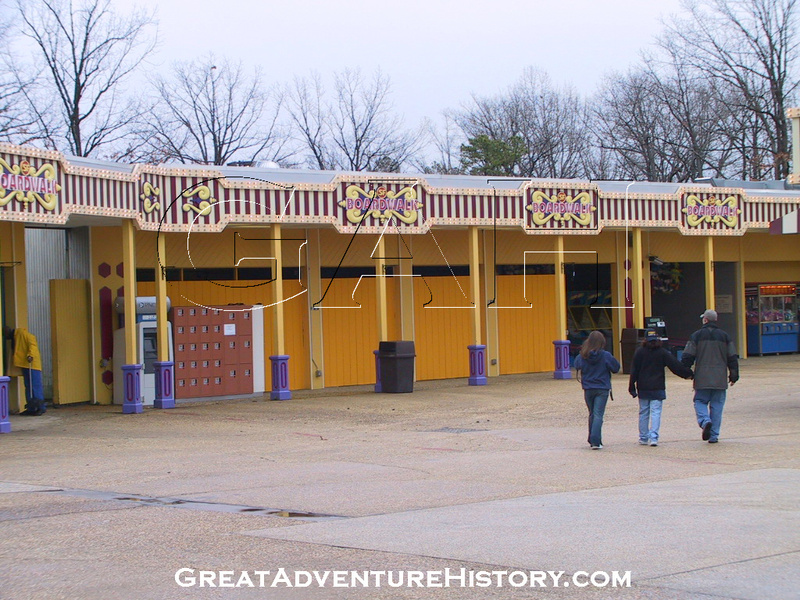 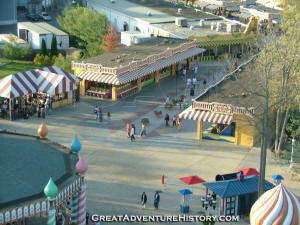 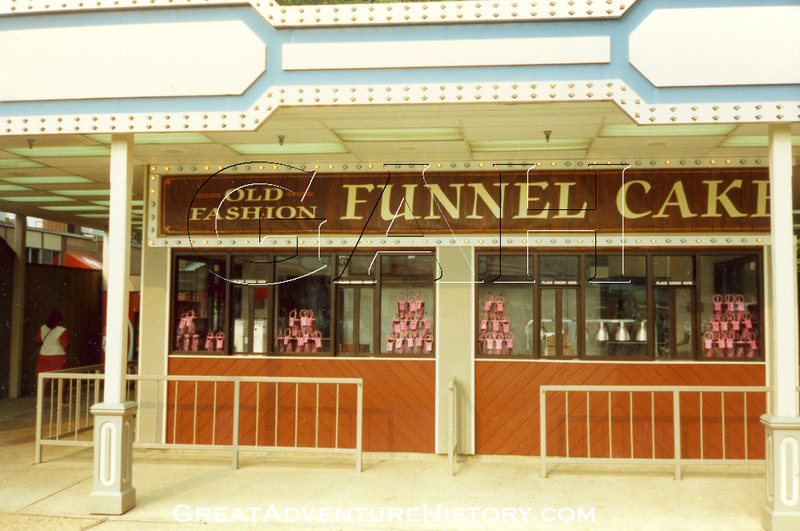 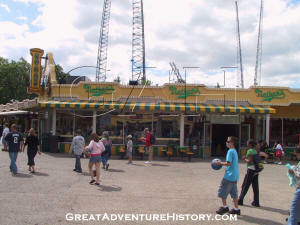 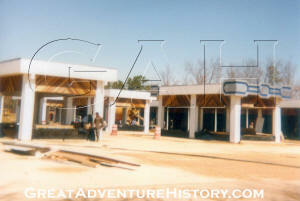 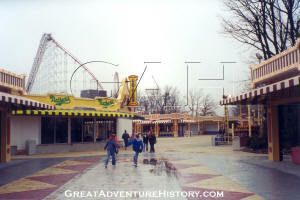 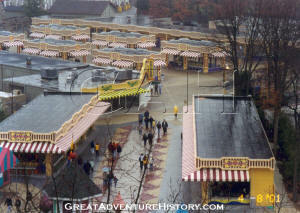 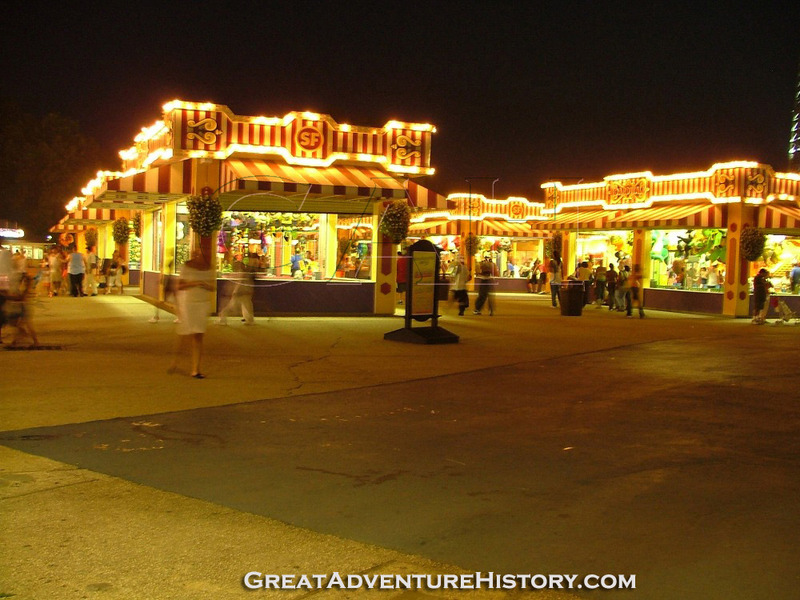 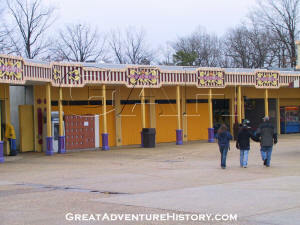 The one towards the Carousel was a re-built Mustard's Last Stand, which served hot dogs and offered covered seating. 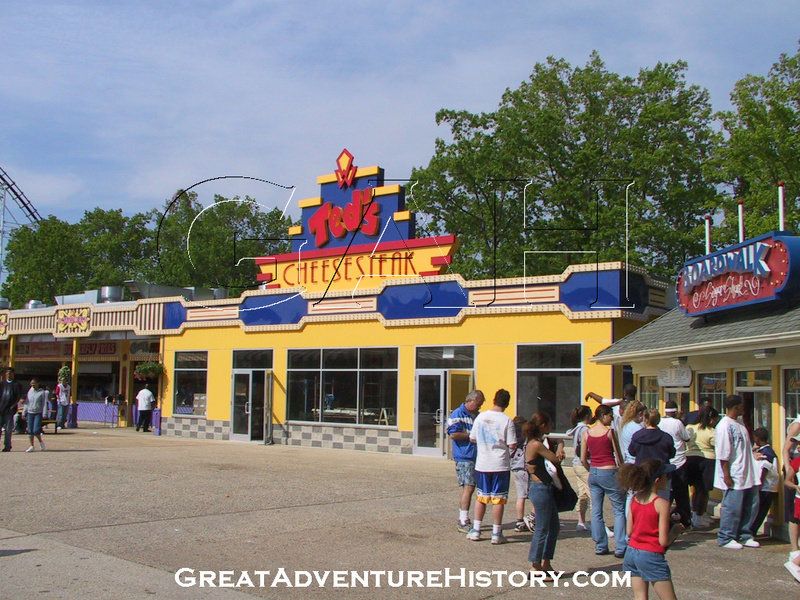 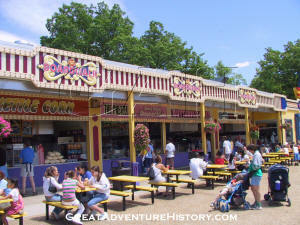 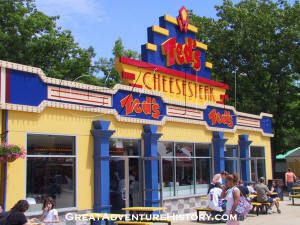 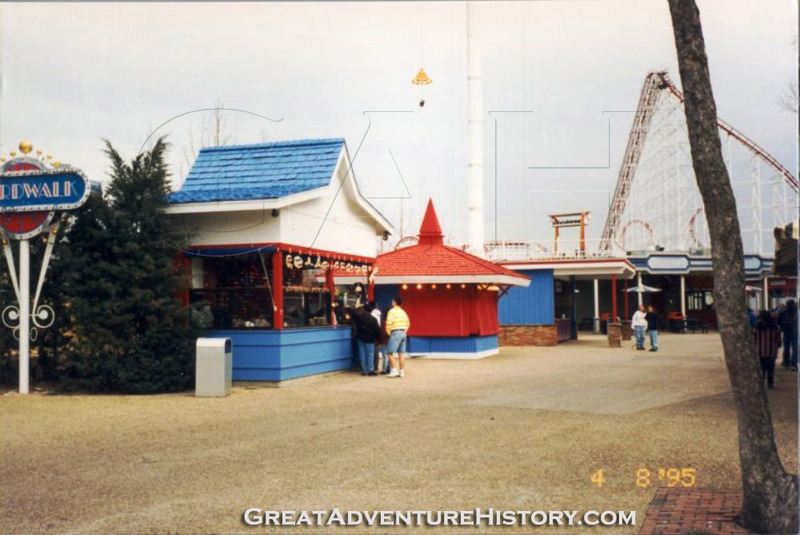 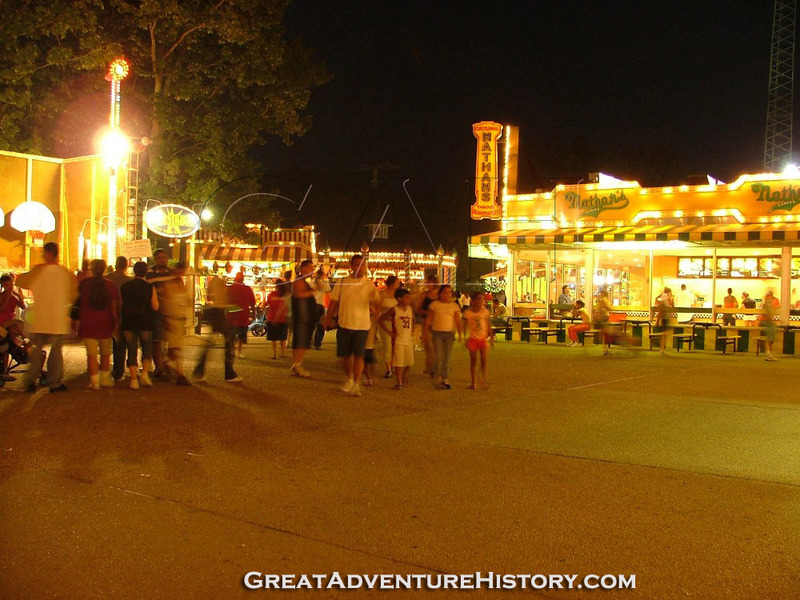 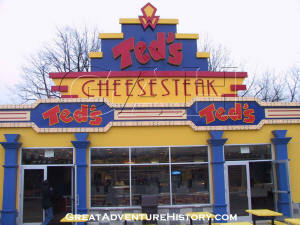 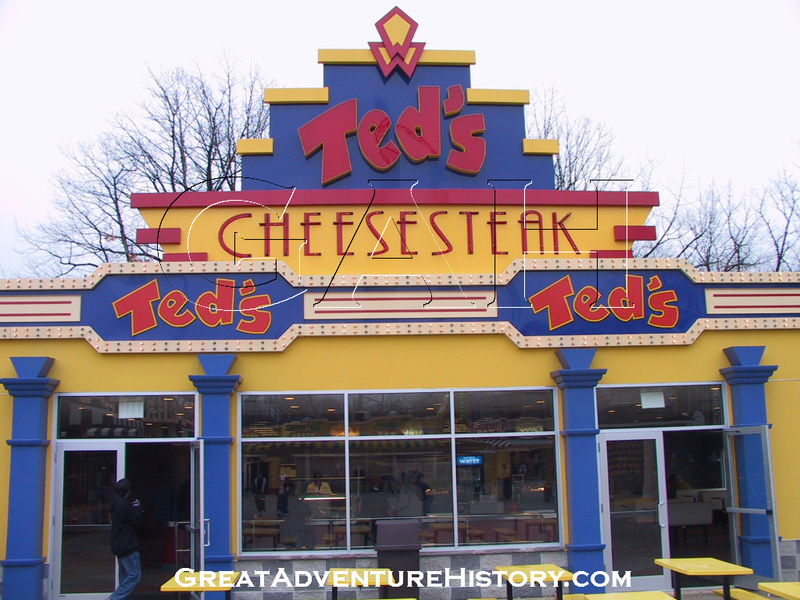 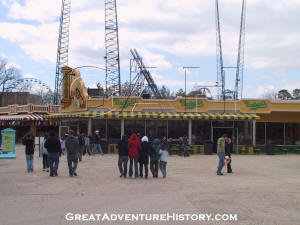 On the opposite side, a mirror image restaurant served french fries (as the Potato Patch), funnel cakes and finally cheese steaks in more recent years. 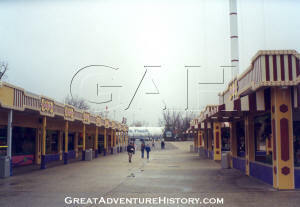 Along the path to Goodtime Alley from the Carousel stood several small shops, which were later moved. 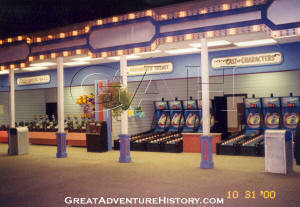 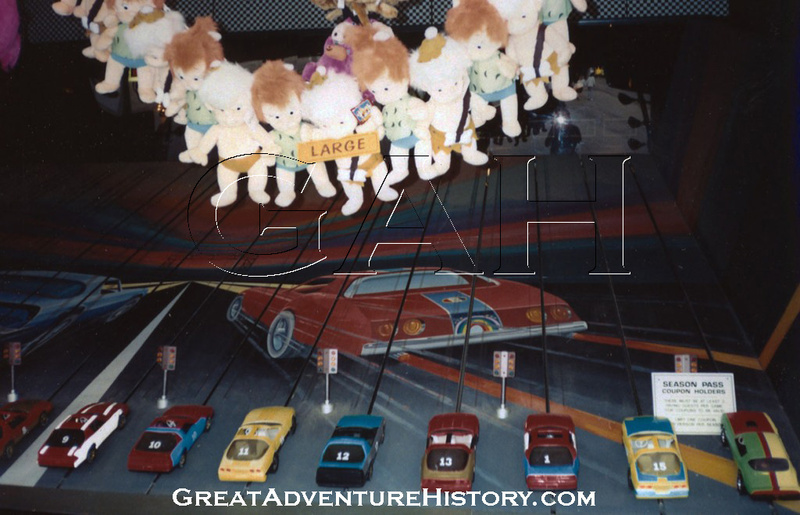 A remote control car game stood on the side of the path next to the Dream Street Arcade, and a free standing clown themed Balloon Race game was right next to the covered patio of Mustard's Last Stand. 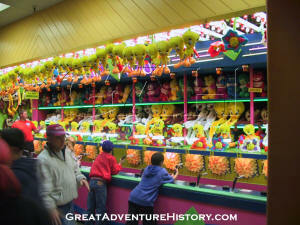 Over the years, the games and prizes have changed as tastes and technology have changed. 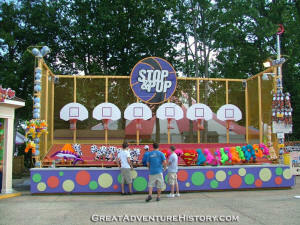 The park has always stayed abreast of the latest trends, introducing the newest game innovations and variations. 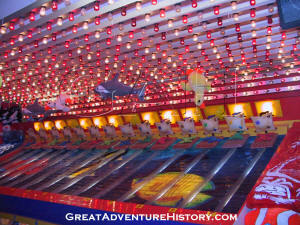 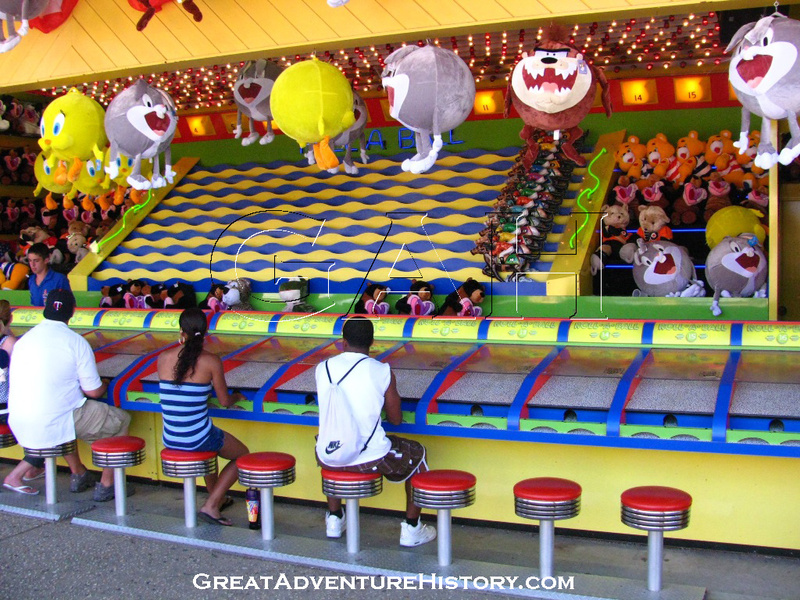 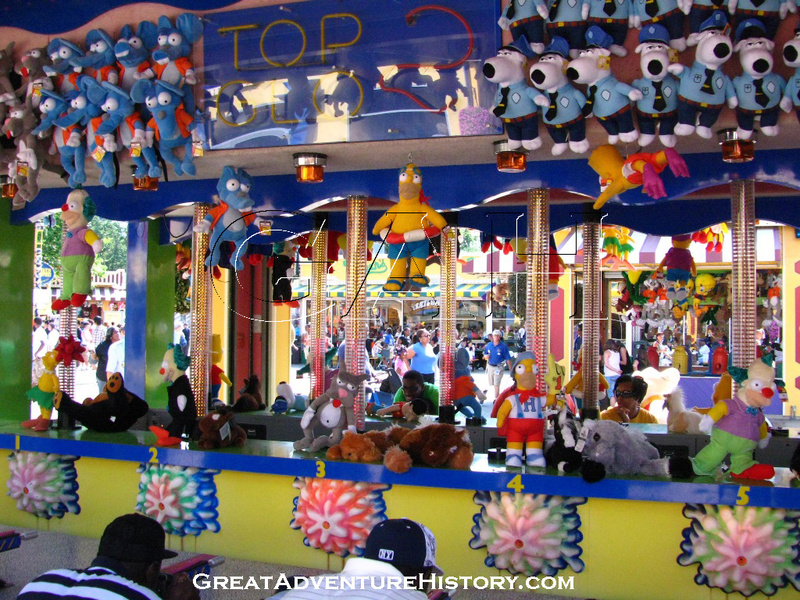 At the introduction of the wildly popular Whac-A-Mole, the park also added a Smack-A-Shark version. 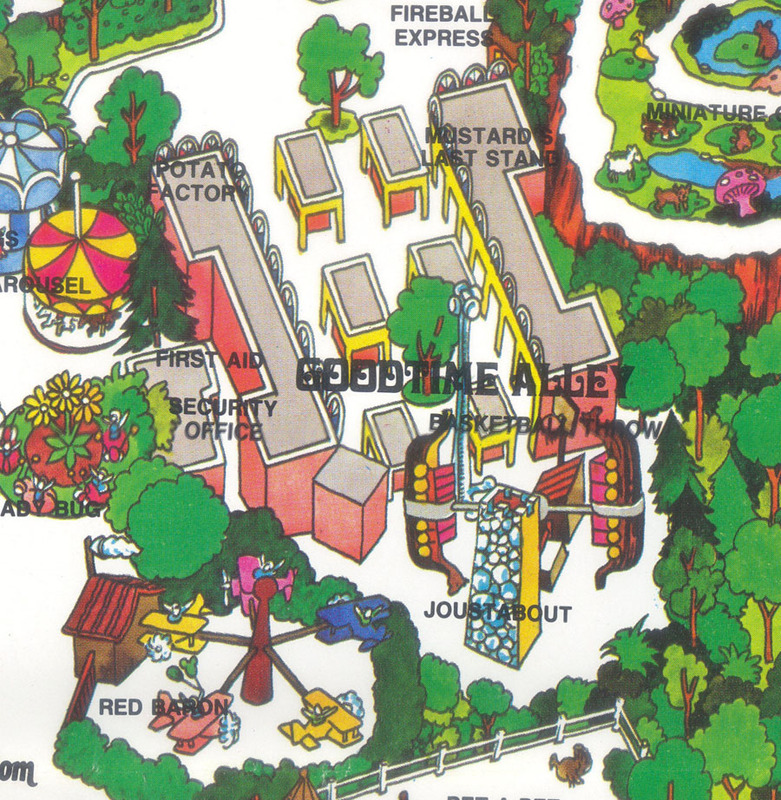 When Frog Bog became a "must have" for games areas everywhere, the park also introduced a version where rubber chickens were launched into pots on spinning grills. All these trends have come and gone along side the standard goblets, ring tosses, milk cans, coin tosses and shooting galleries. 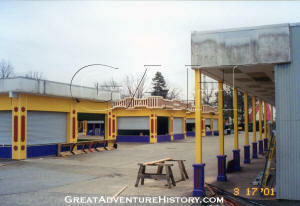 In the 90's Goodtime Alley started getting a facelift, with fresh paint and new colors added to the buildings which were beginning to look very dated. 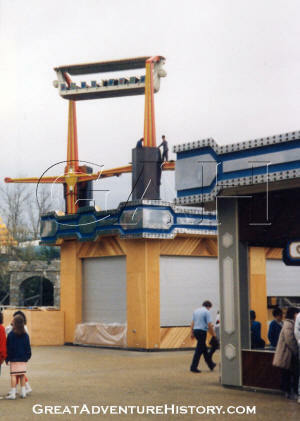 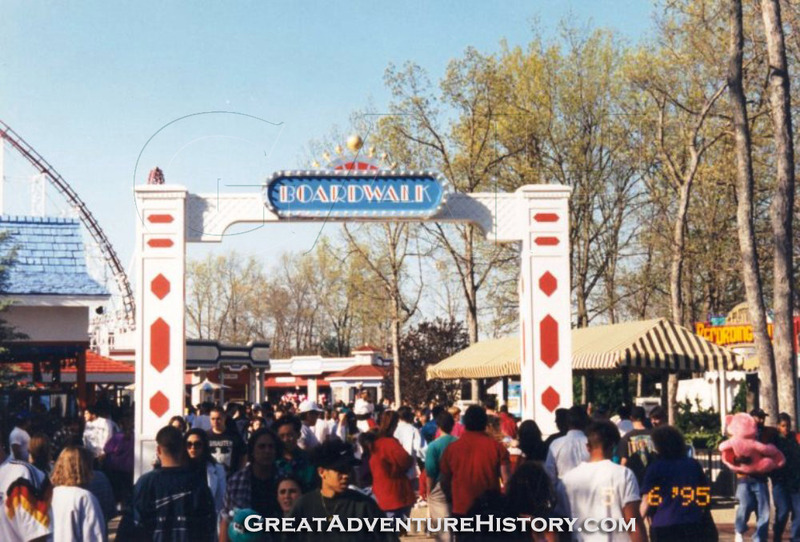 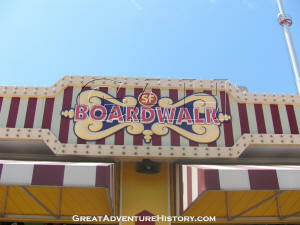 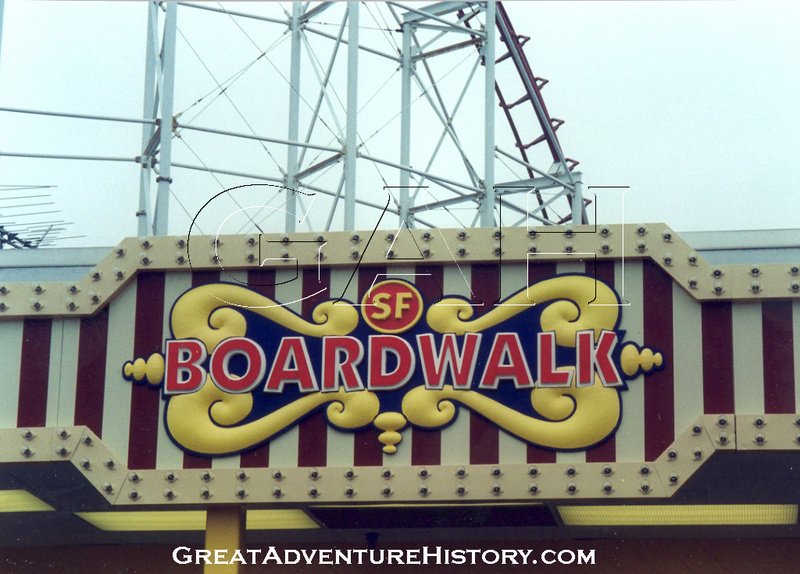 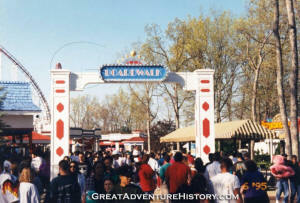 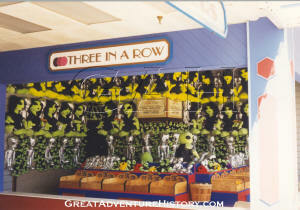 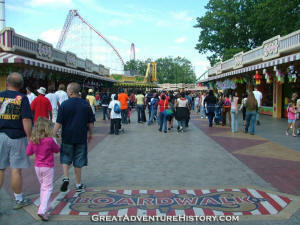 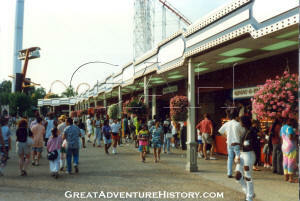 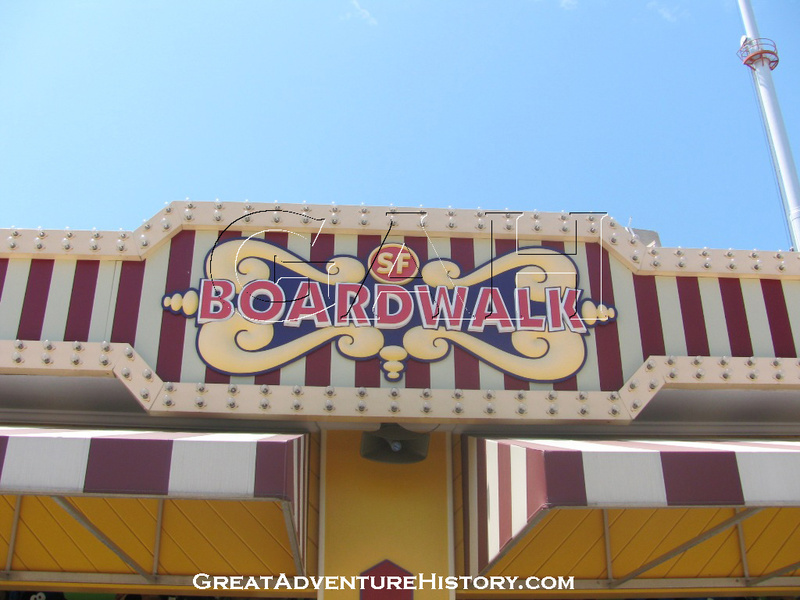 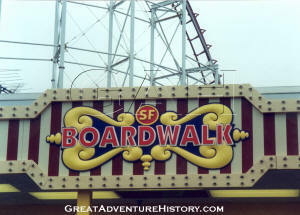 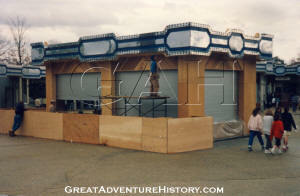 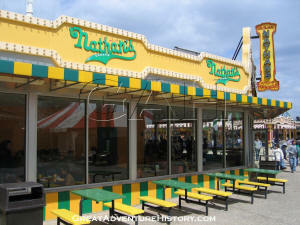 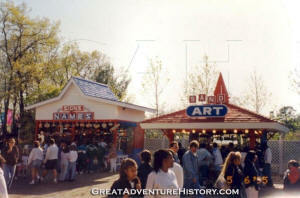 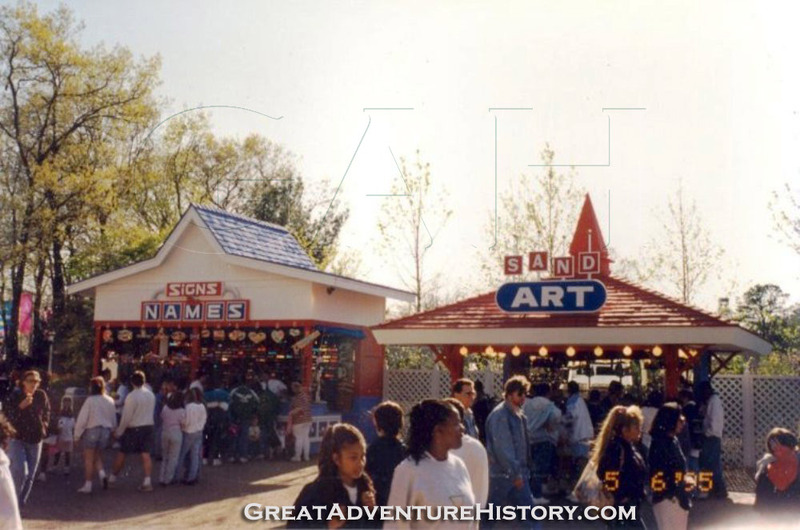 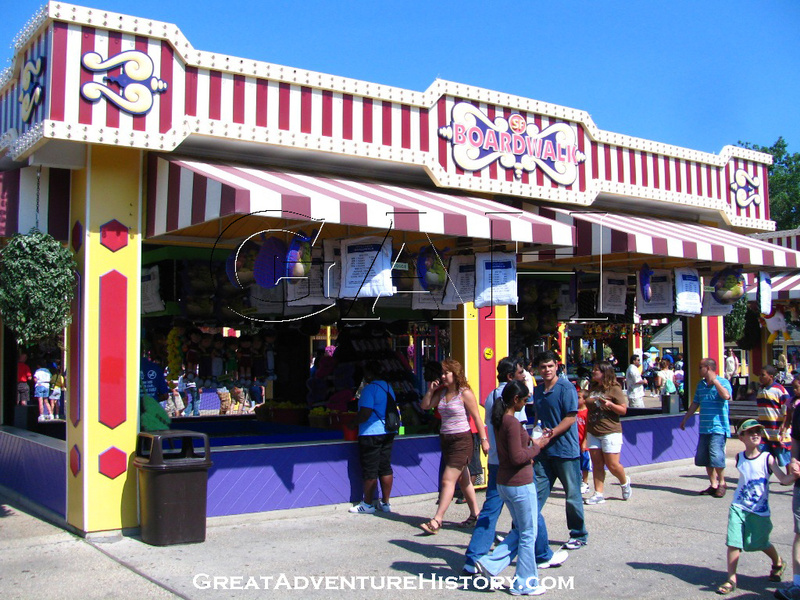 The section was renamed the Boardwalk in 1995 getting some minor improvements in paint and theme. 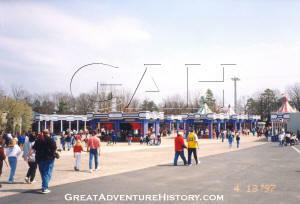 The new red and blue color scheme did little to enhance the look of the section, and finally in the 2000-2001 off season the buildings got a comprehensive makeover. 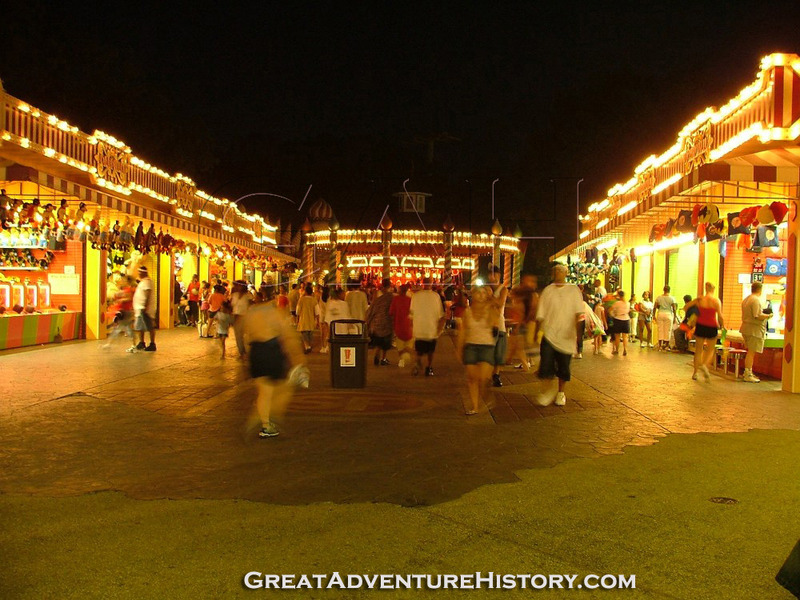 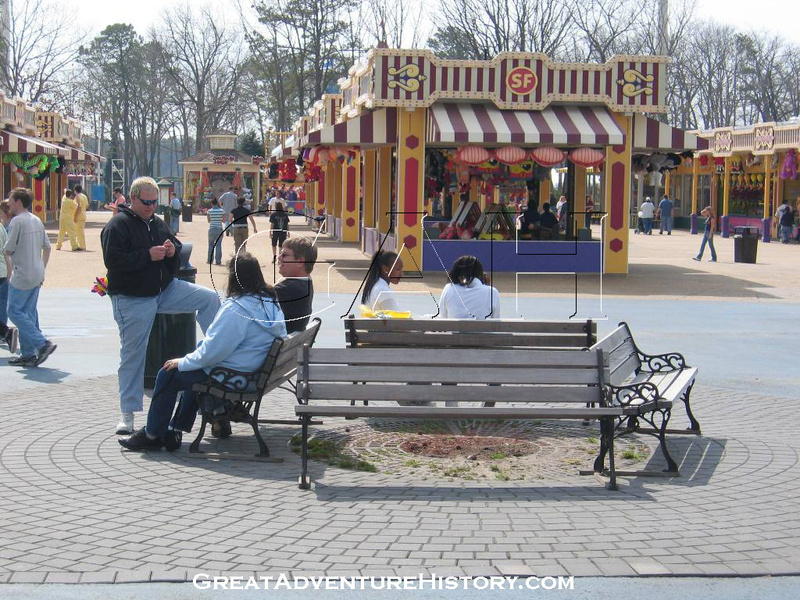 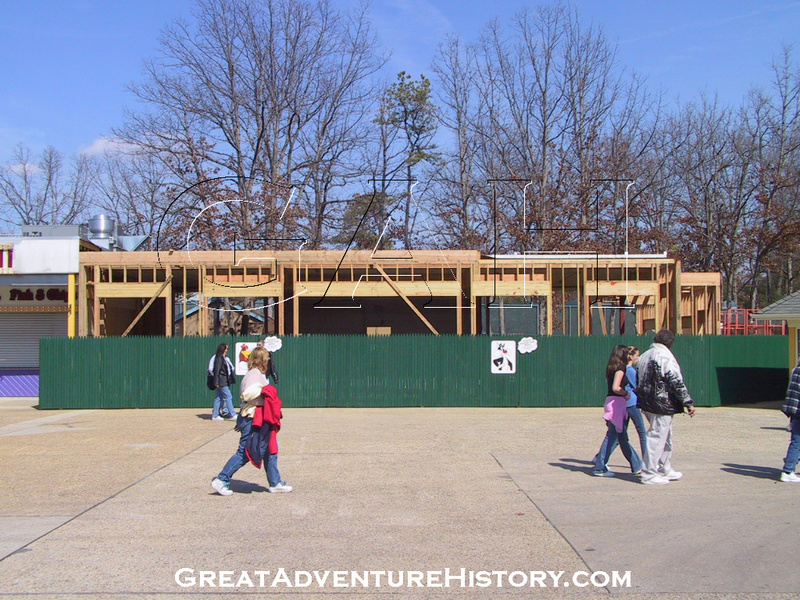 The conversion of Goodtime Alley into the Boardwalk was a massive makeover, and involved removal and moving of some structures, repurposing of others and an expansion into the path towards the Carousel. 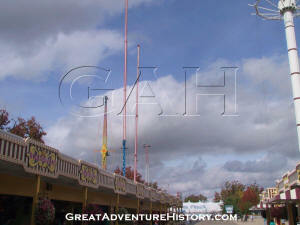 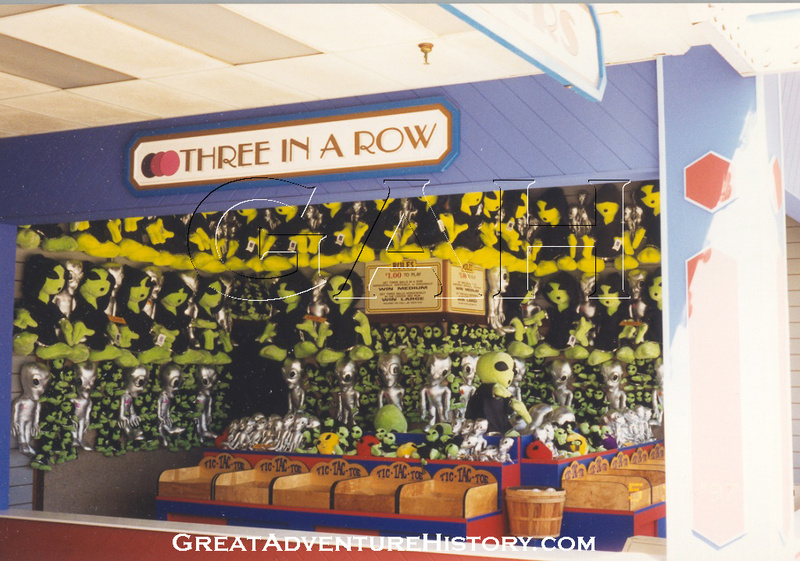 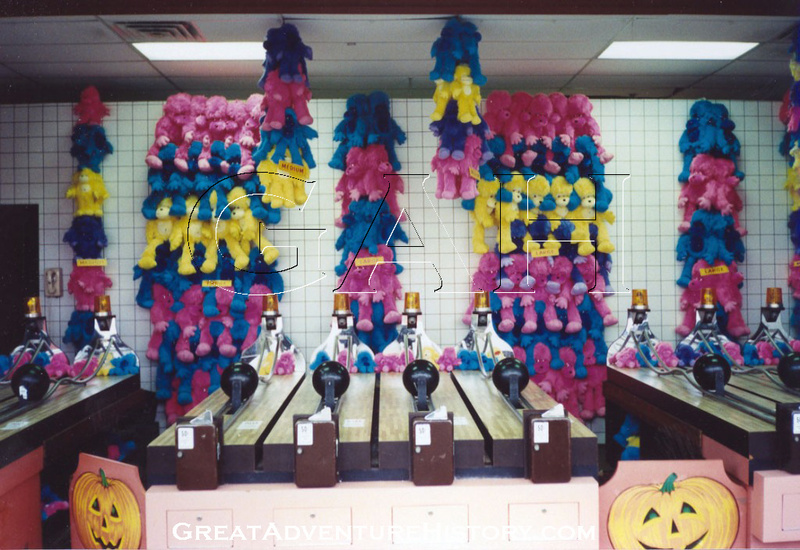 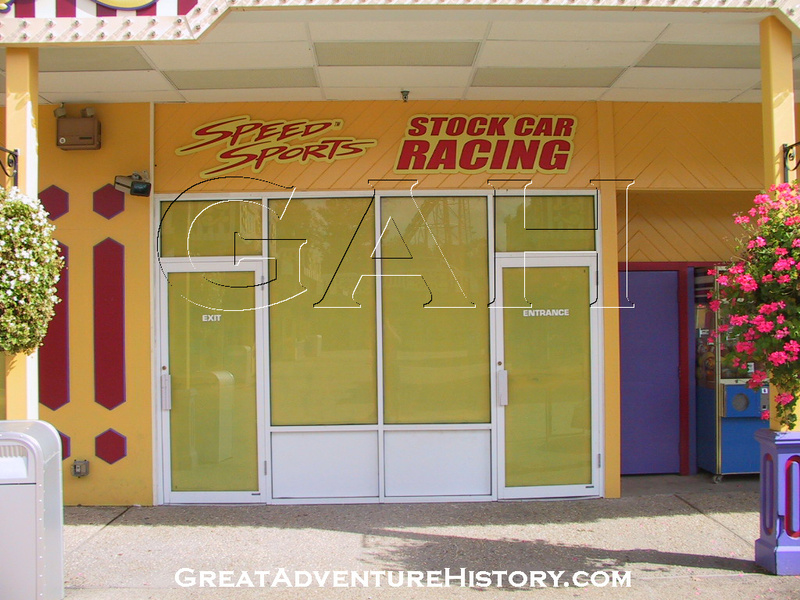 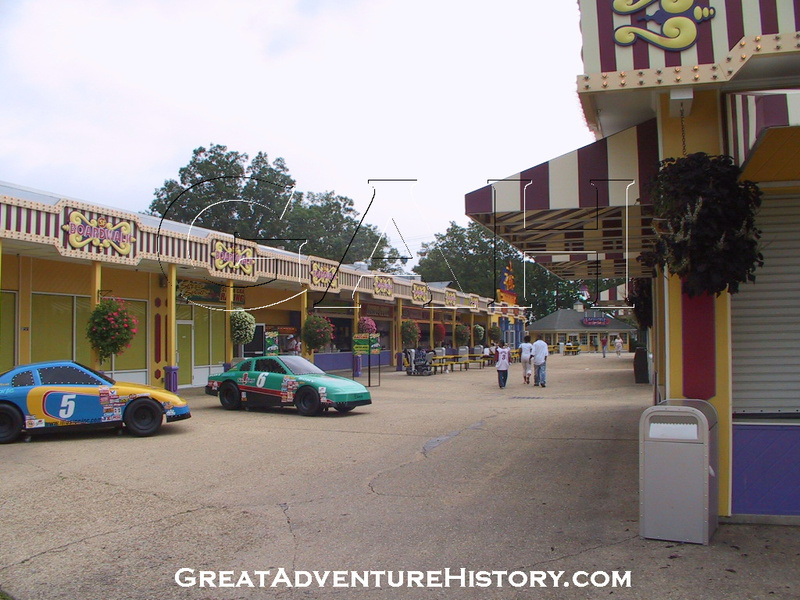 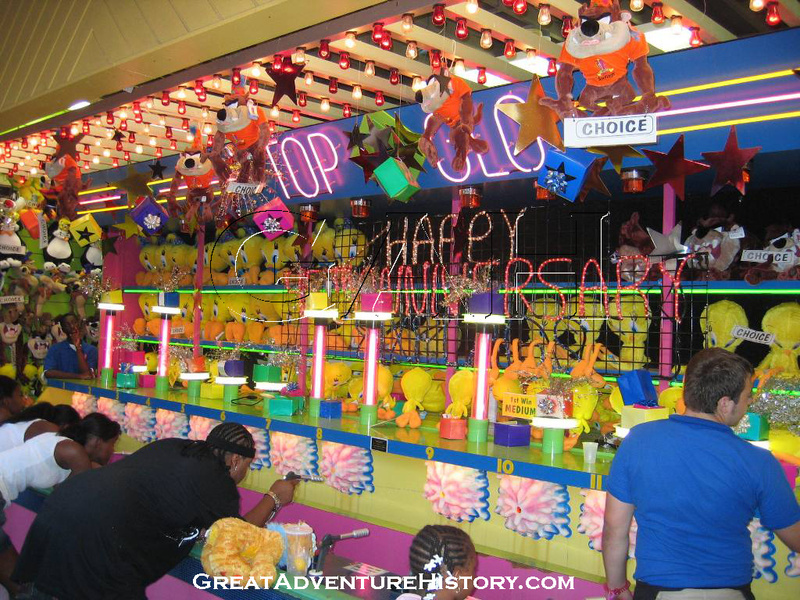 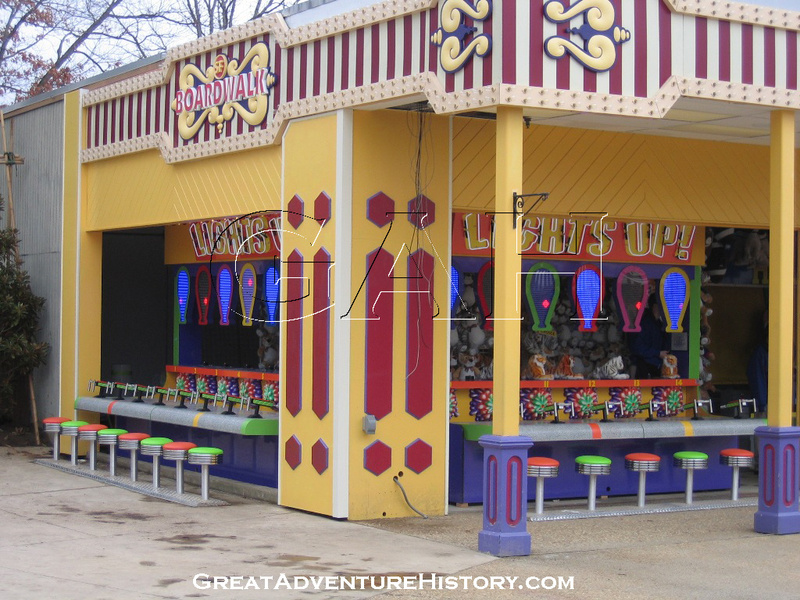 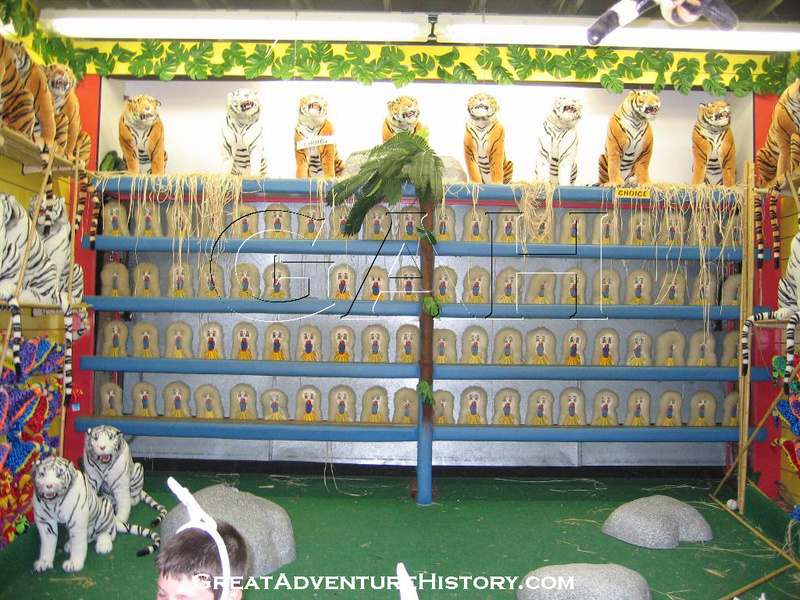 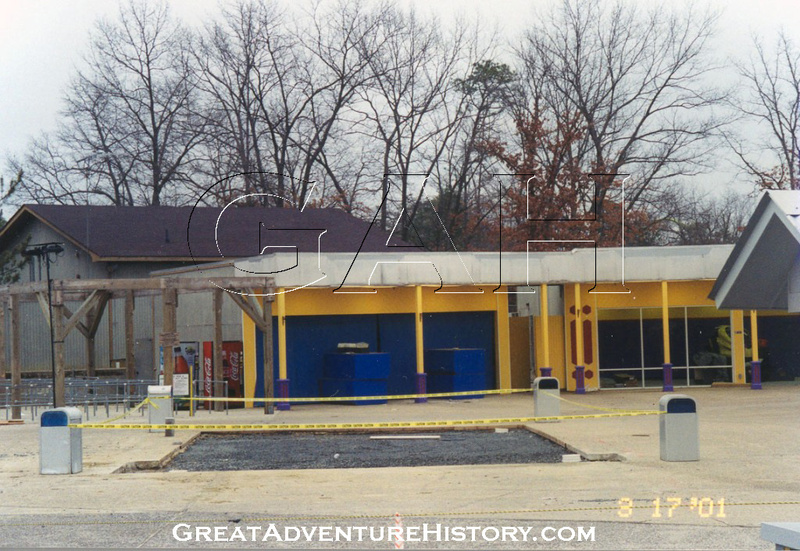 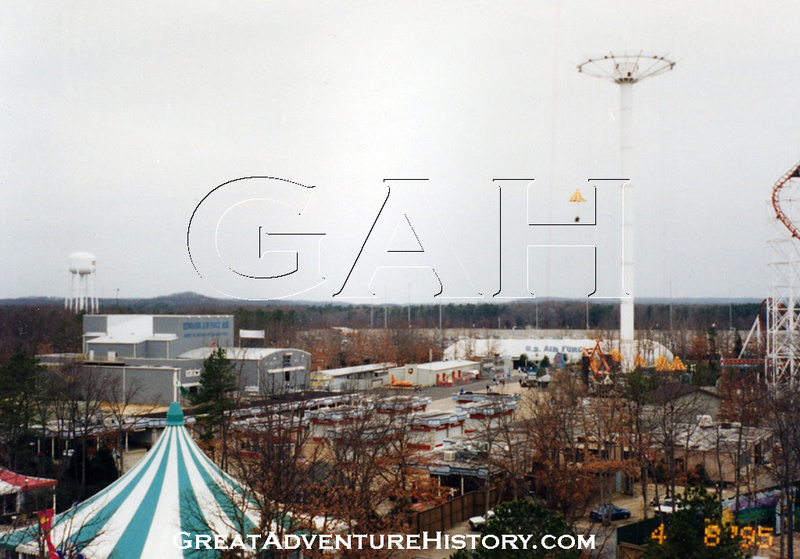 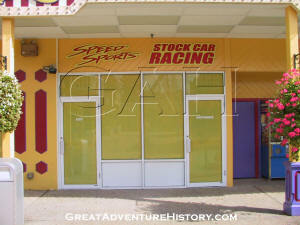 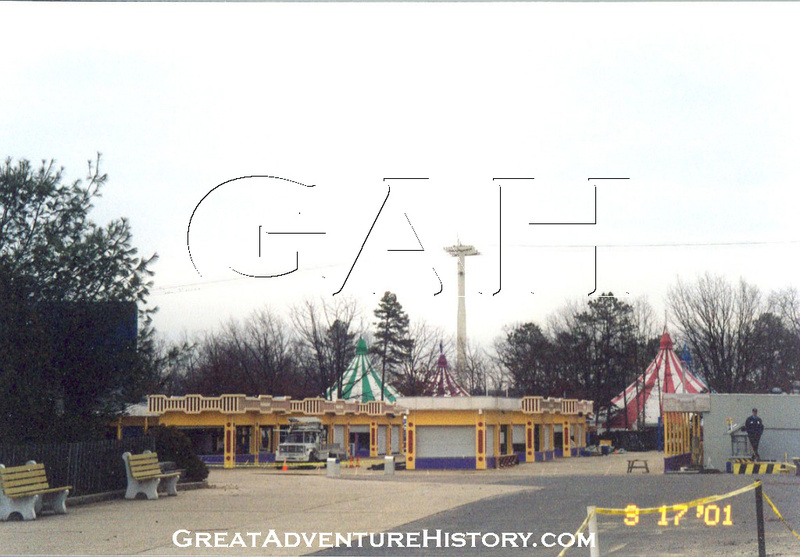 In March of 2001, during "early bird" Season Pass Processing, progress was well underway, with the buildings all painted in the bright new yellow color scheme, and the upper bands of chasing lights partially refurbished and re-hung around the buildings. 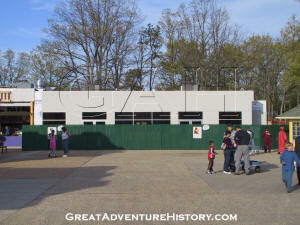 The seventh of the center free-standing games which had been located at the top end of the section had been removed, and its former location was prepared for the pouring of a new concrete slab. 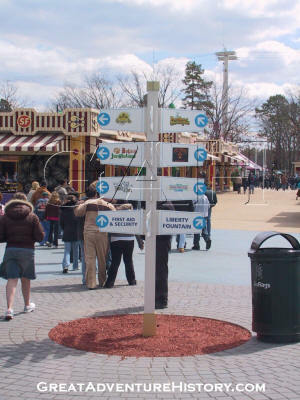 At the other end, the octagonal Guess Your Weight booth was moved to the edge of the path, out of the middle of the games area. 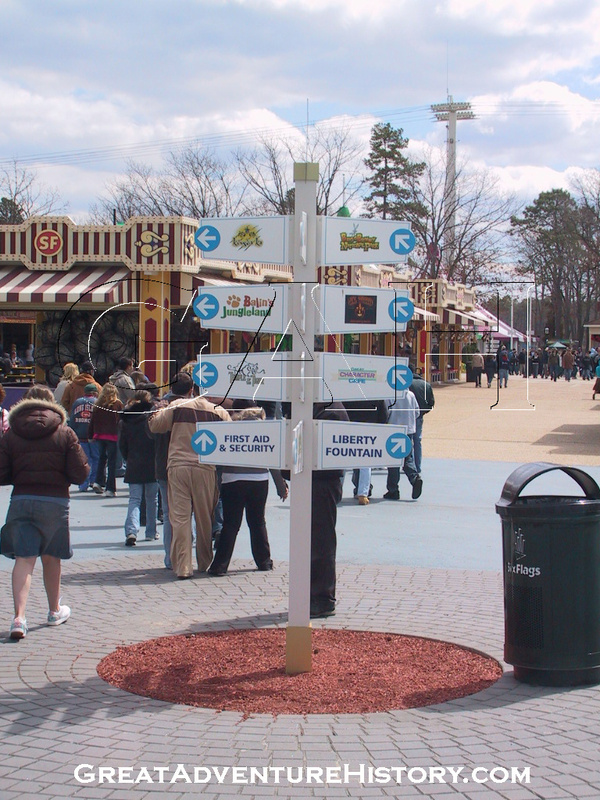 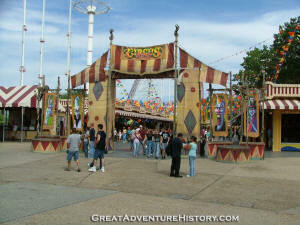 The biggest changes involved the construction of two additional strips of games along the pathway to the Carousel. 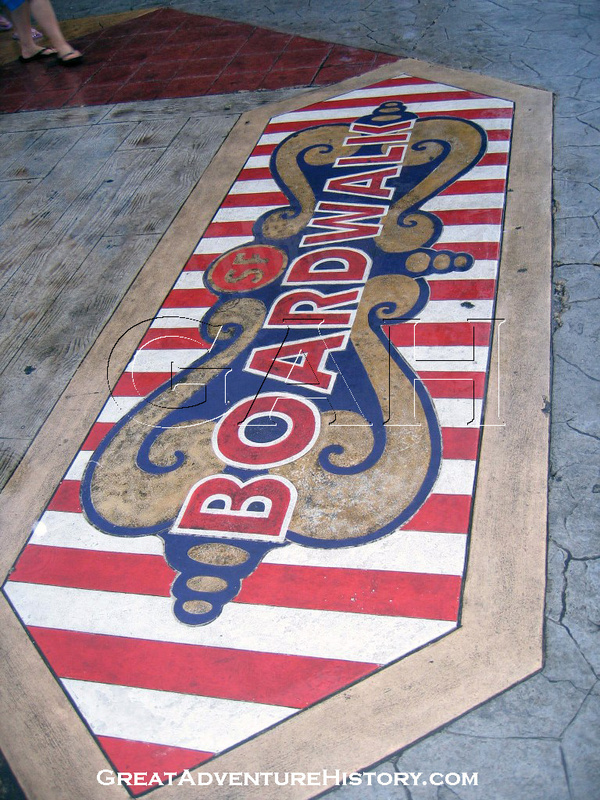 The new area featured new textured concrete pavement in colorful patterns as well as an inlaid "Boardwalk" sign at the entry. 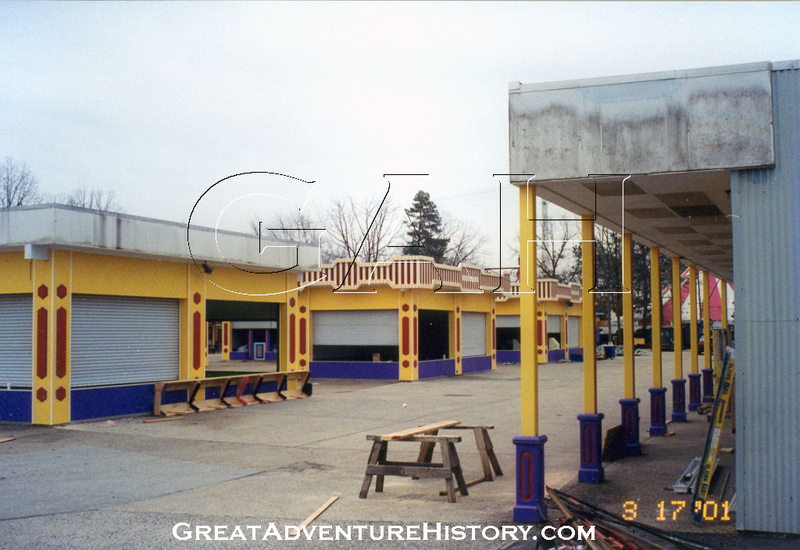 To round out the remodel, additional awnings were added around the free standing buildings and the new buildings, providing much needed protection from sun and weather. With the addition of more games the already stretched staffing meant that many games would sit closed except on peak attendance days. 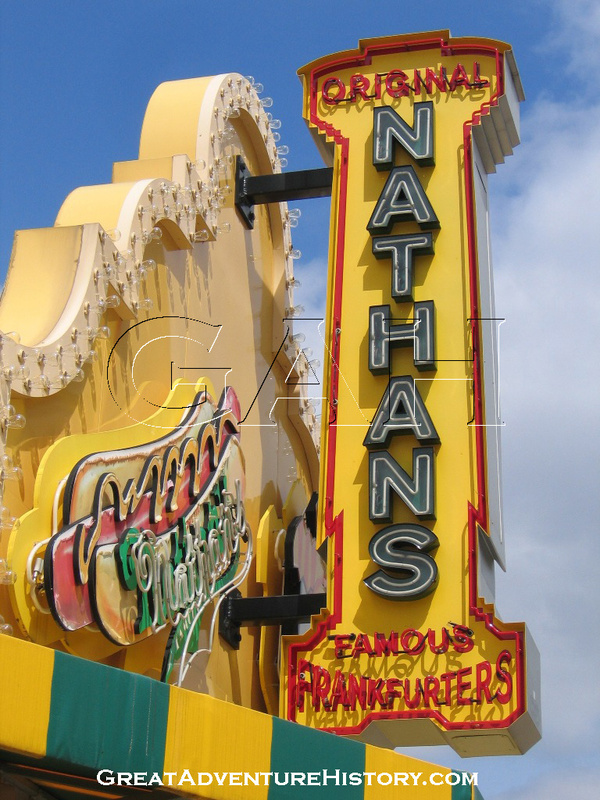 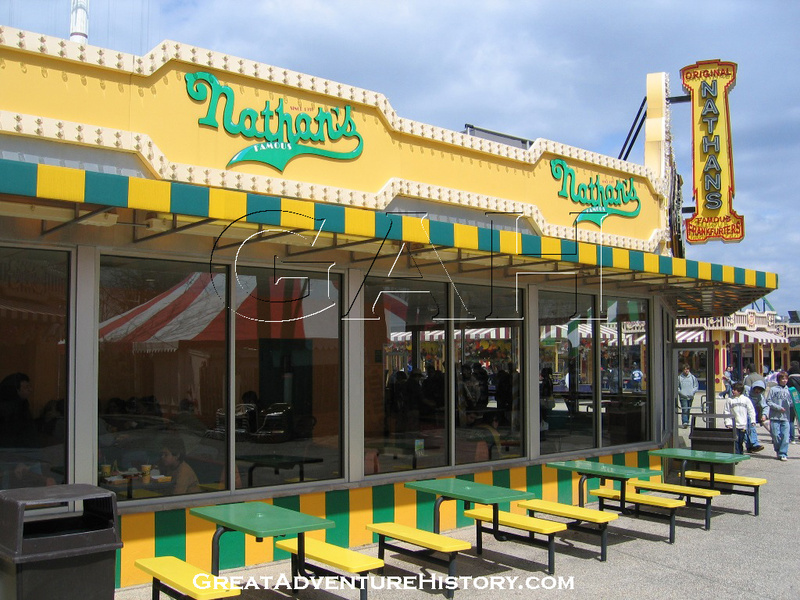 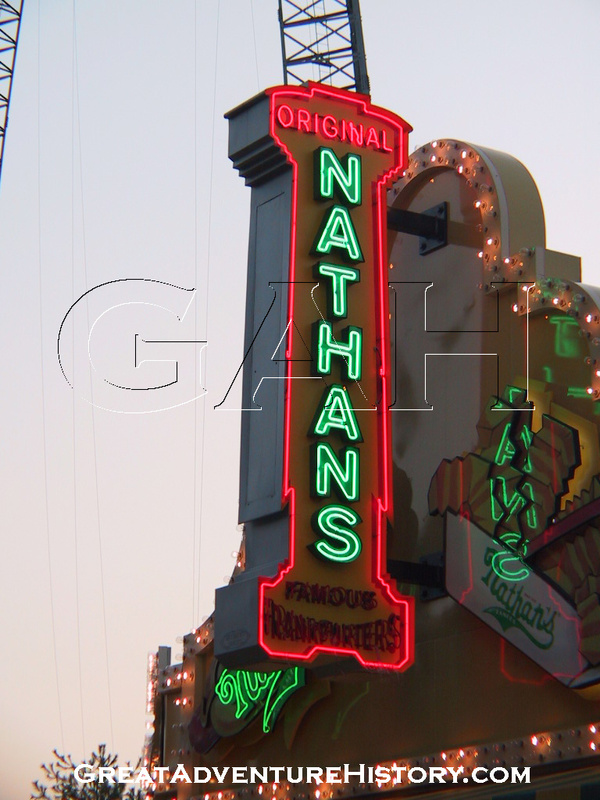 Another drastic change came with the addition of Nathan's Famous Hot Dogs to the corner once occupied by Mustard's Last Stand. 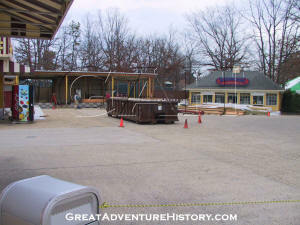 The transformation included enclosing the former open air dining area and creating a climate controlled restaurant which would prove popular on hot days and cold days. 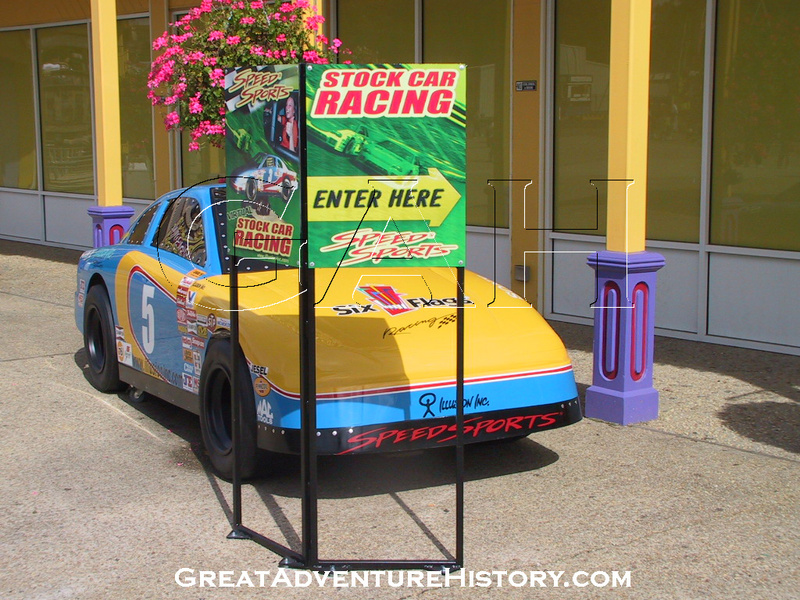 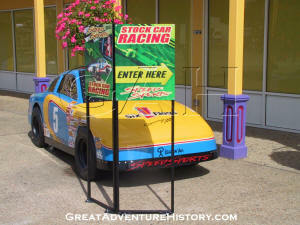 Some of the former games which had more or less been abandoned along the far side of the square were converted into a Virtual Stock Car Racing upcharge attraction. 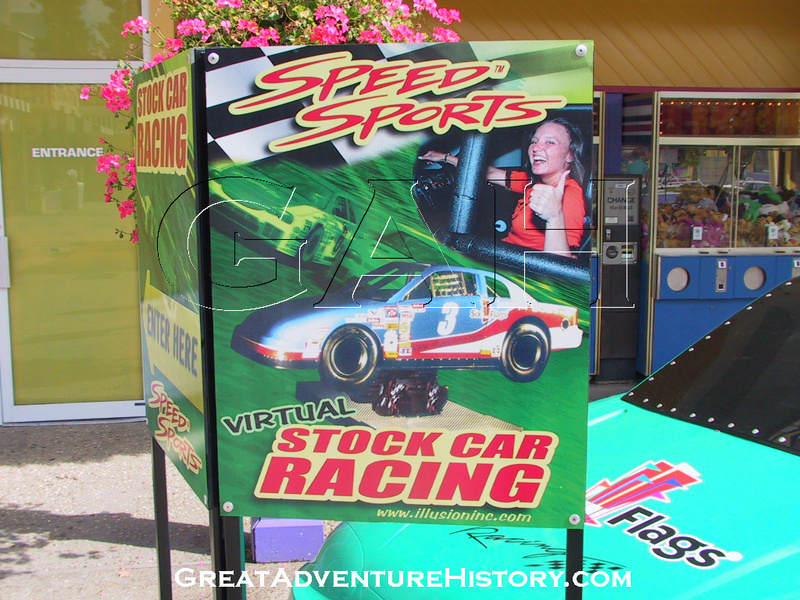 The spot had been home to an arcade and a virtual reality gaming center in previous seasons, but the NASCAR style experience did little to entice park guests to spend money. 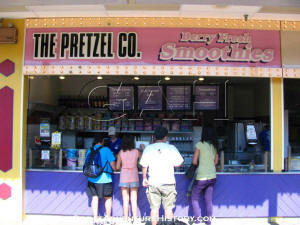 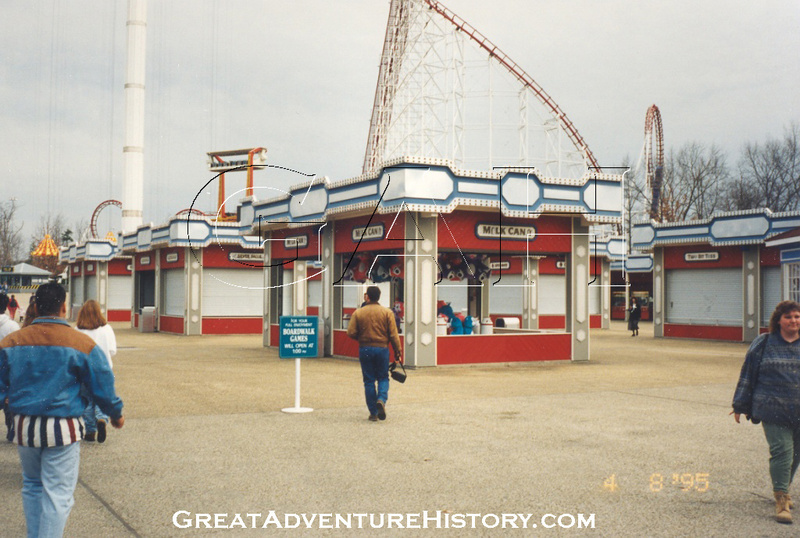 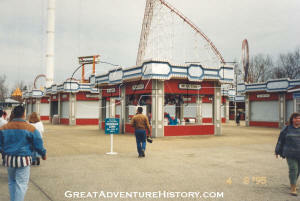 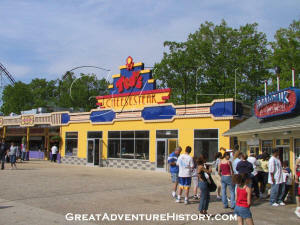 For 2002, the focus of the Boardwalk turned to food, with the expansion and enclosure of the Cheese Steak stand. 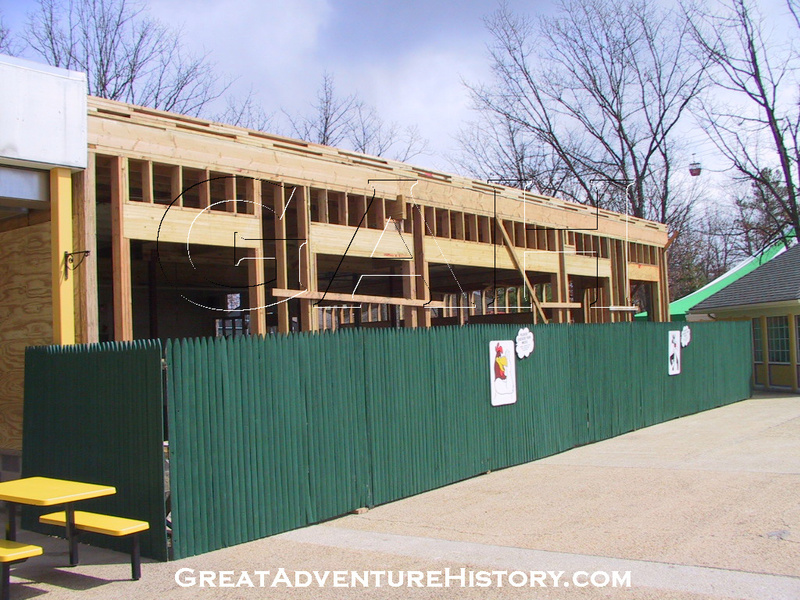 Over the early weeks of the season, work progressed with the framing and enclosure of the building to create another climate controlled dining facility. 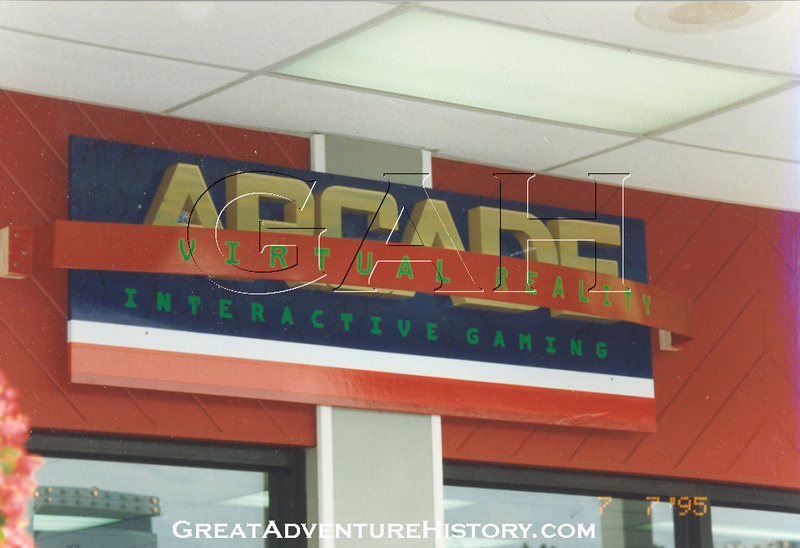 In the adjoining strip that had once been filled with games, the space was converted into a food court, run by private contractors. 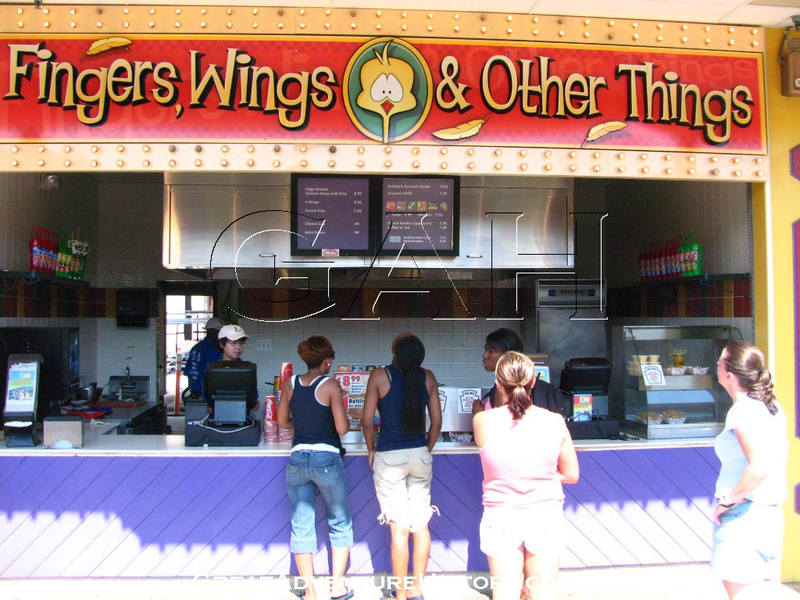 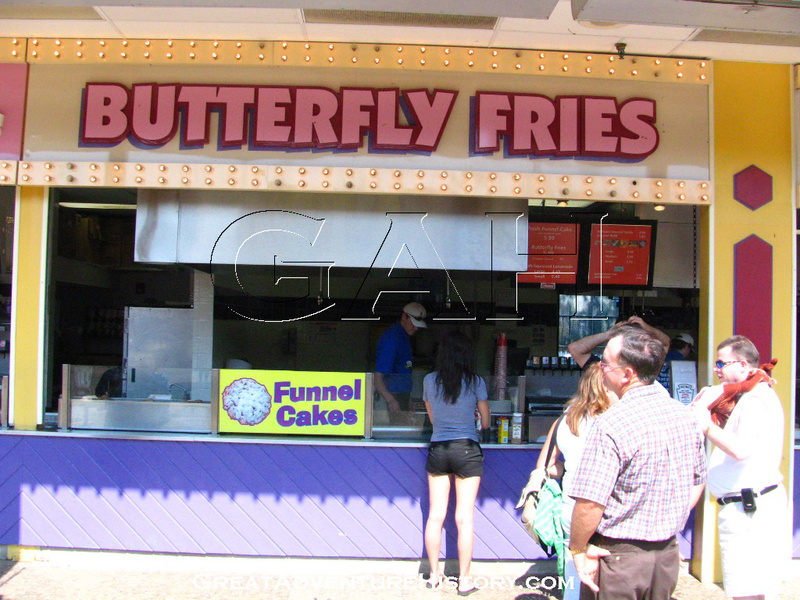 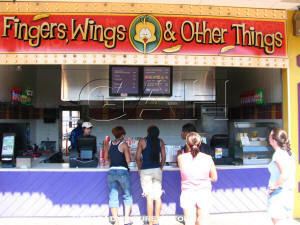 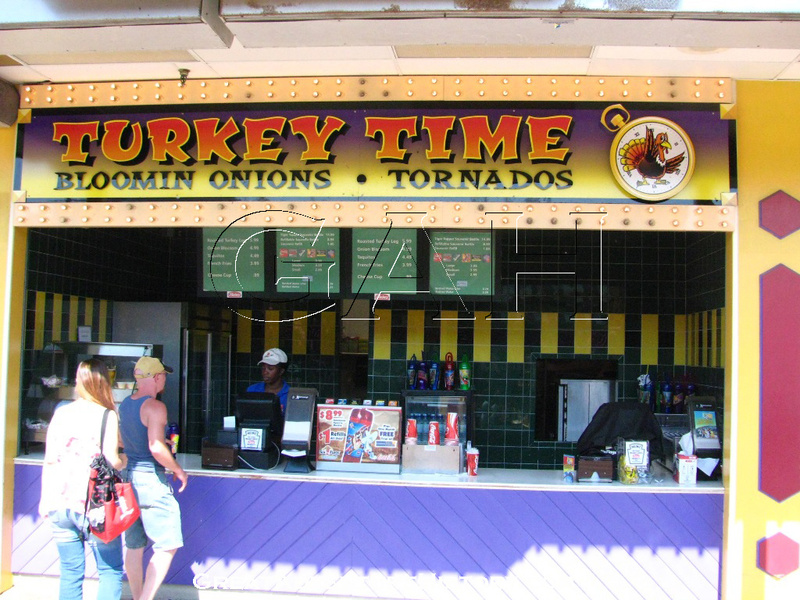 The new food court brought additional varieties of food to the park like turkey legs, blooming onions, and Jamaican patties, plus additional outlets for fried food of all kinds. 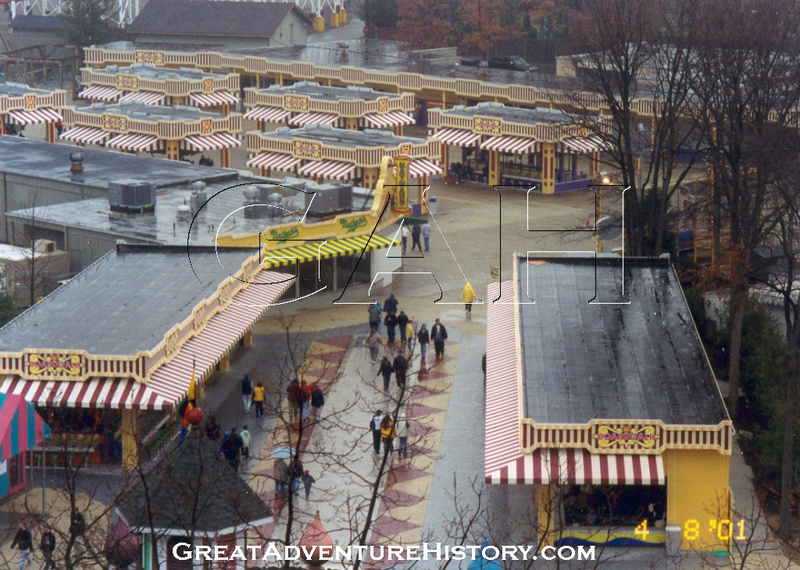 Rows of tables were placed just outside the roof overhang, creating a place for guests to sit and eat. By the end of spring, the new Ted's Cheesesteaks was open and ready to handle the summer crowds, offering a place to cool off and grab a bite. 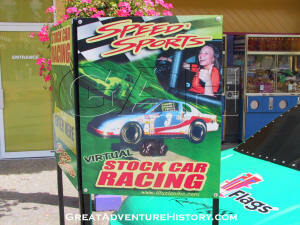 For the 2003 season, the Virtual Stock Car Racing was removed, and was replaced with an array of virtual reality games. 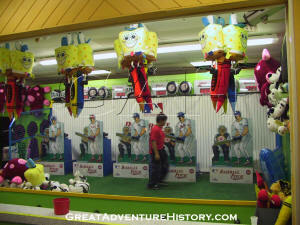 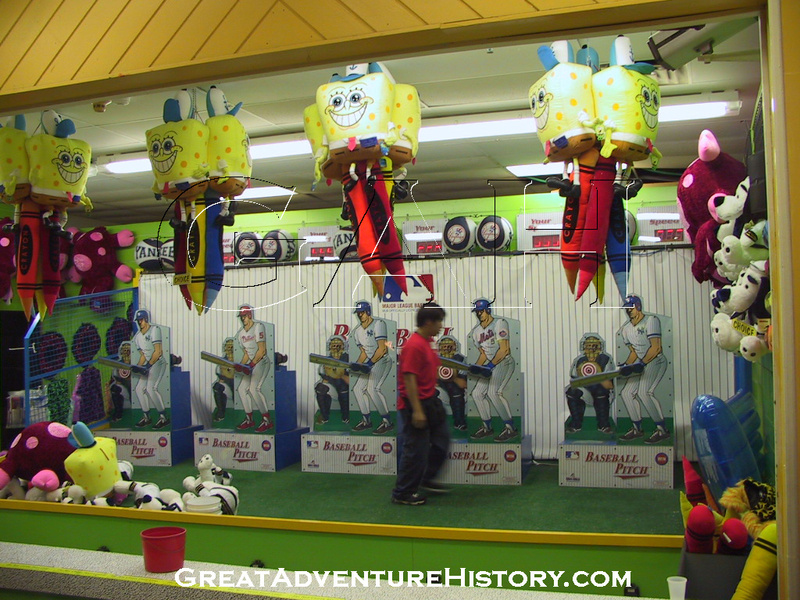 Increasingly more coin operated cranes and other games which required fewer human attendants were added, creating walls of machines where traditional games of skill once were. 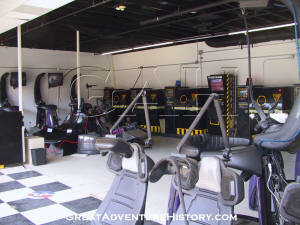 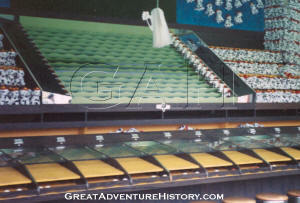 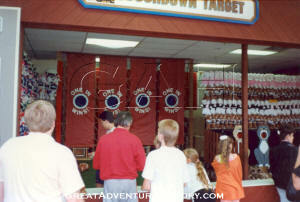 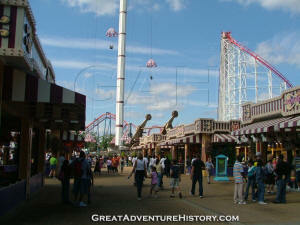 Over time, the arsenal of attractions at the top of the section, drawing guests past the games has changed and evolved. 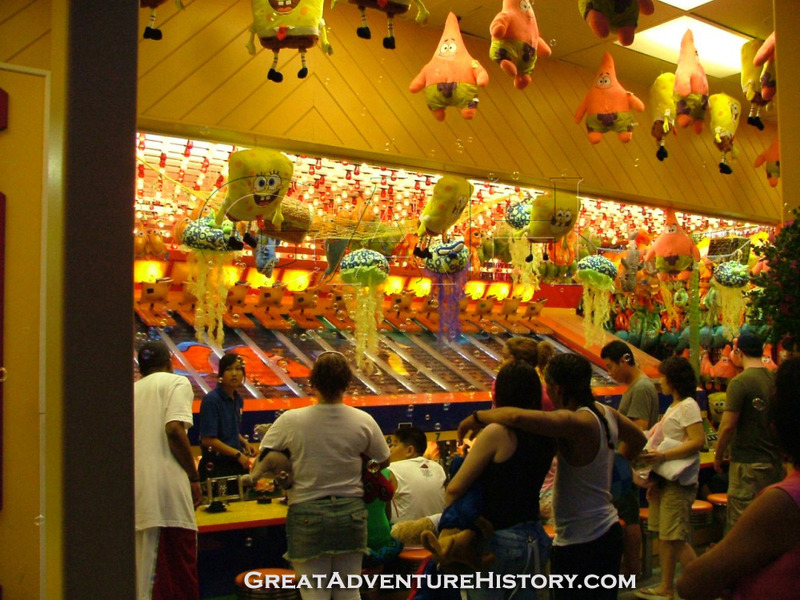 Many of the newest, tallest, fastest, most innovative and most eye catching attractions have been placed there, luring families past tempting prizes. Keeping current with the latest trends in characters and games has maintained the Boardwalk's popularity over time. Generally whatever the latest trends are in pop culture are reflected in the prizes. 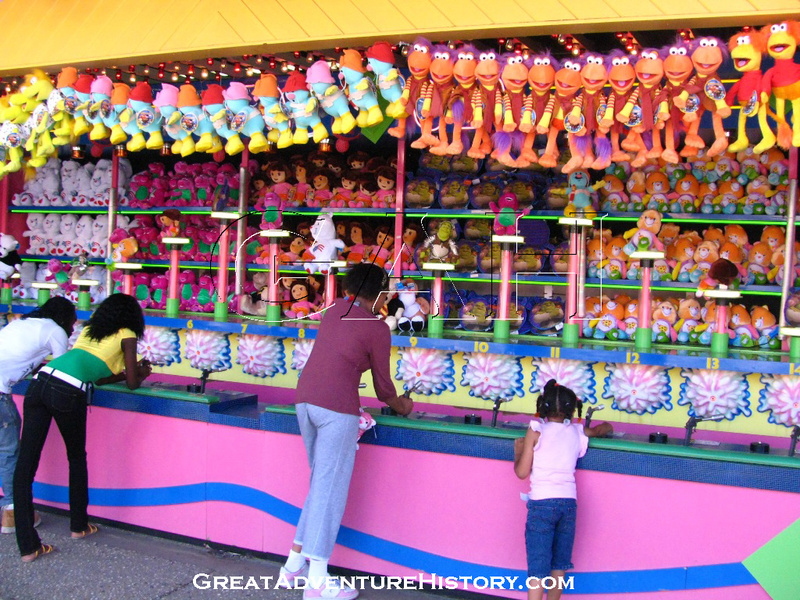 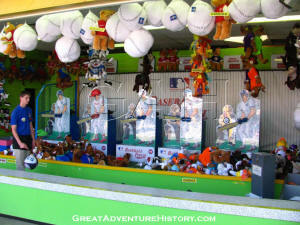 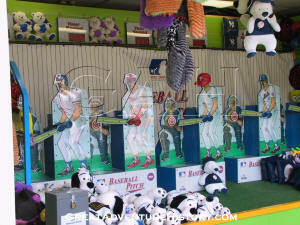 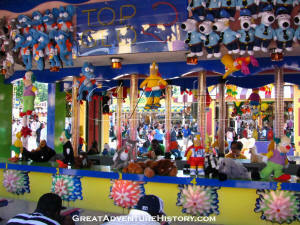 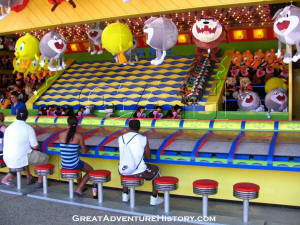 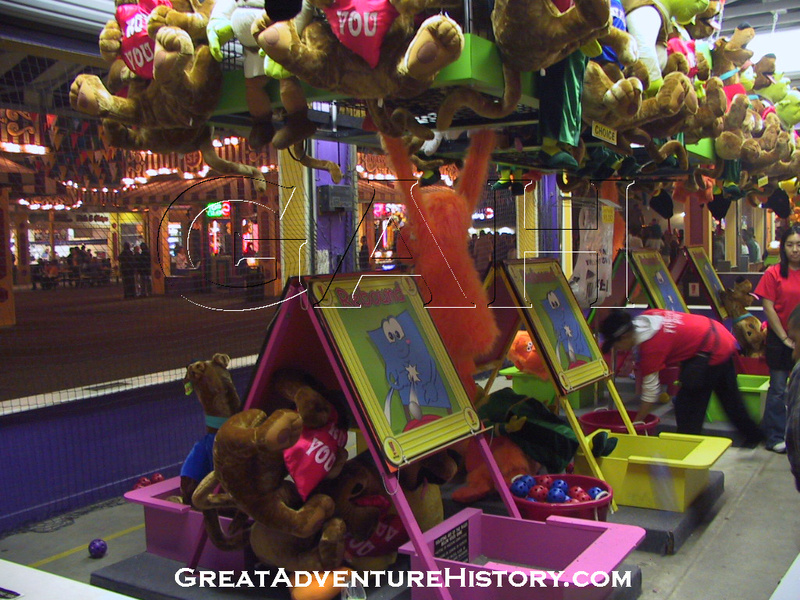 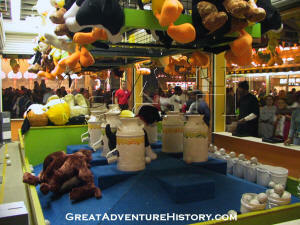 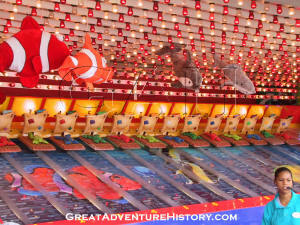 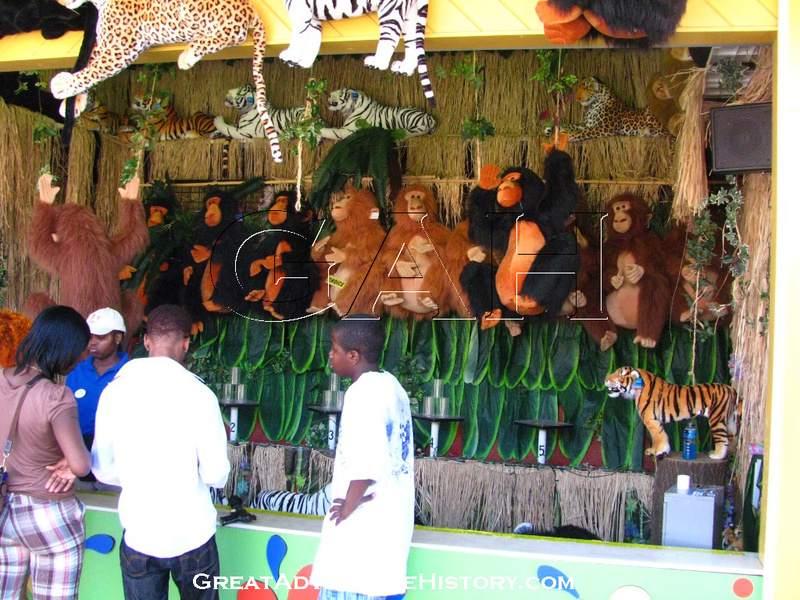 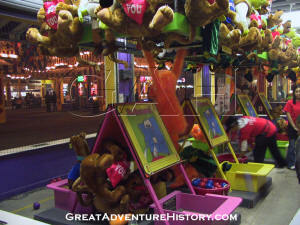 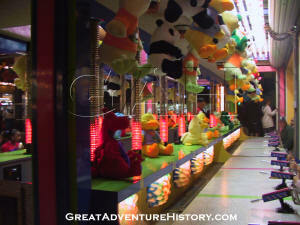 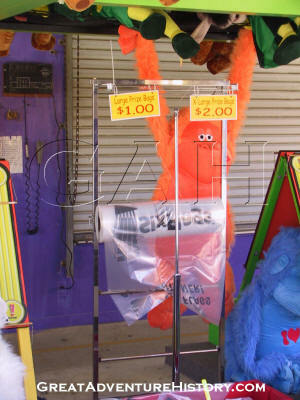 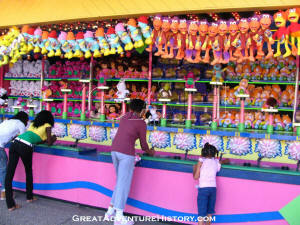 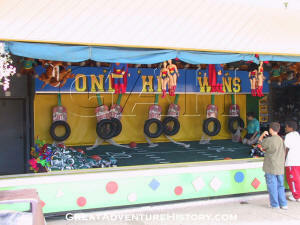 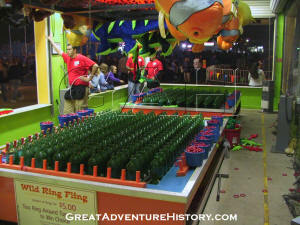 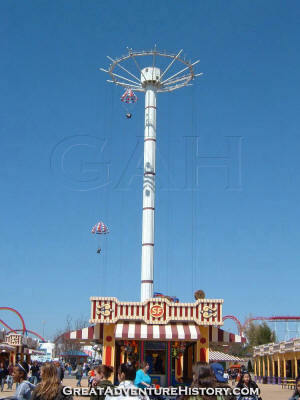 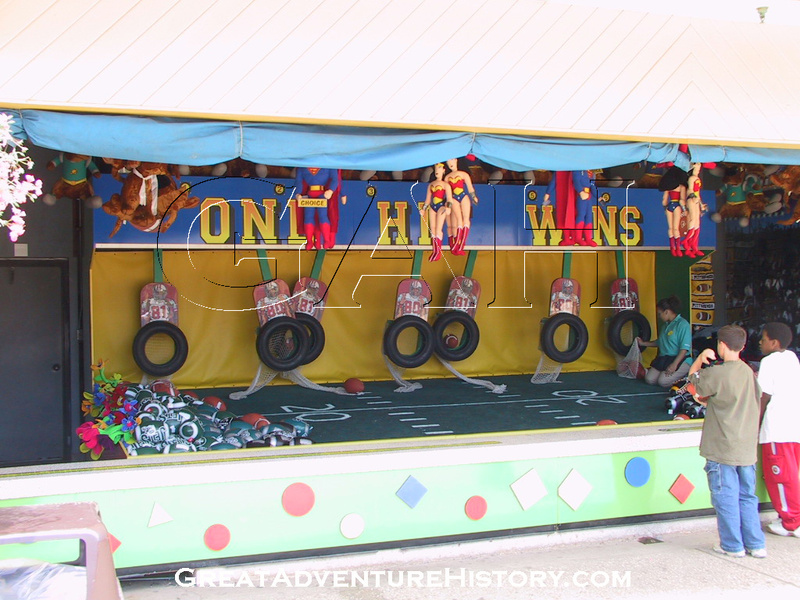 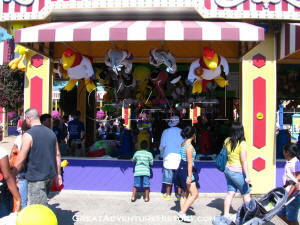 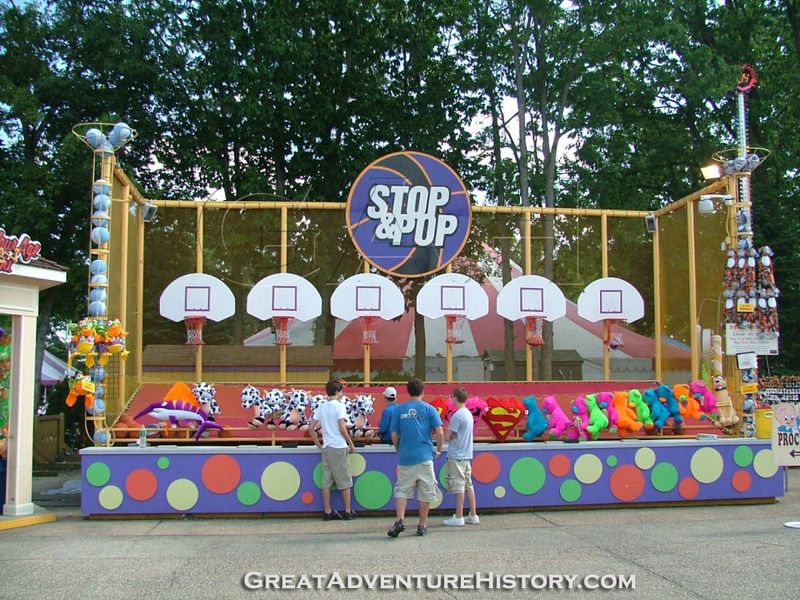 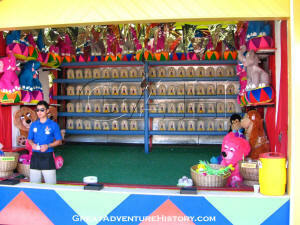 The games are constantly updated as well, bringing new technology, and new twists on the traditional carnival games. Where once games featured mechanical devices, they now feature more and more electronics. Balloon races that featured popping rubber balloons are now represented with LEDs that show a player's progress. 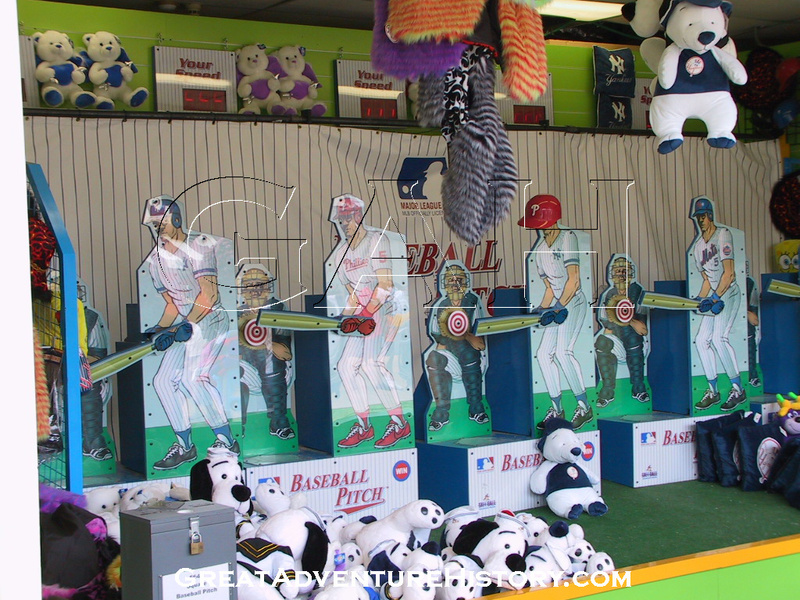 Lo-tech pitches and ring tosses still exist, but seem dated in comparison to the newer games, and don't have the same kind of appeal to kids who were raised on video games and other electronics that they once did. 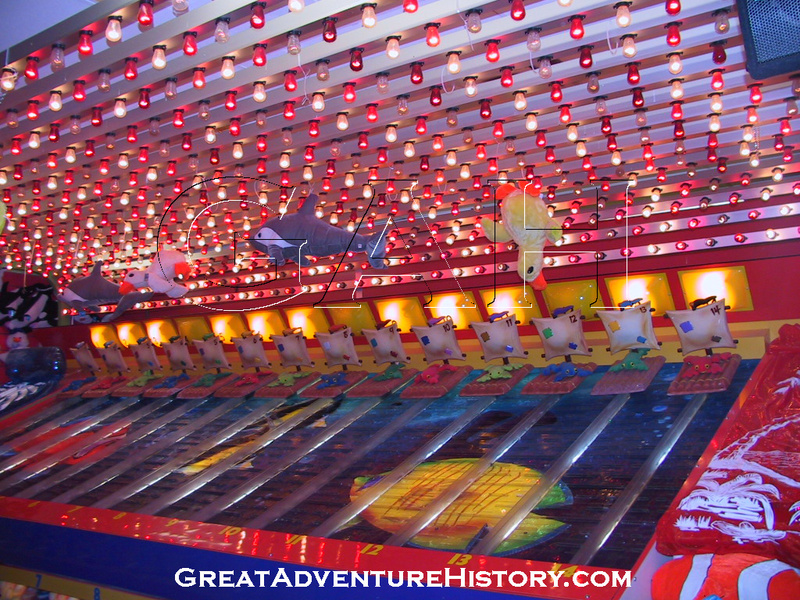 The bright lights and colors capture the eye, as the sounds of music and attendants do their best to draw the passing crowds. 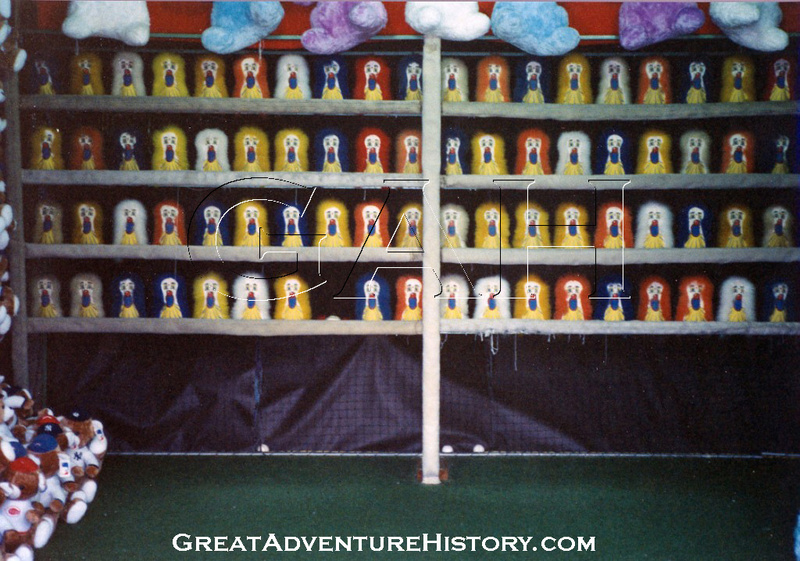 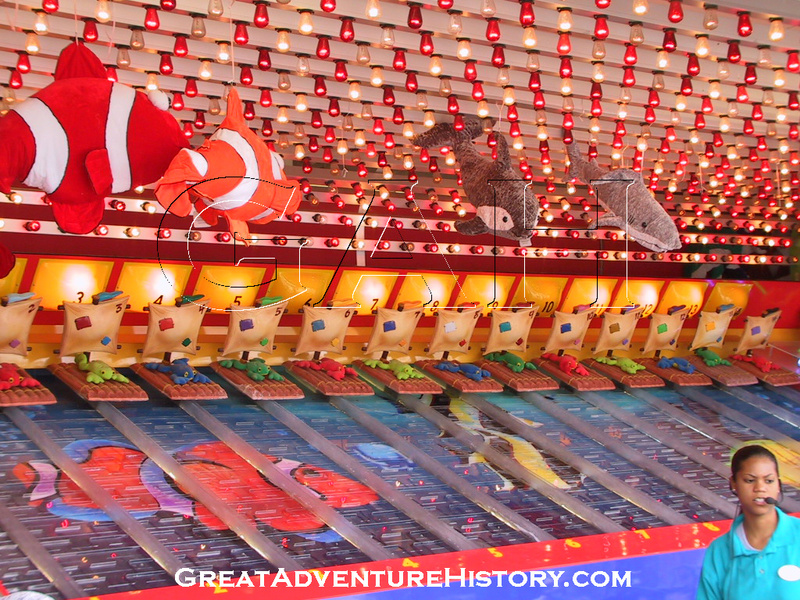 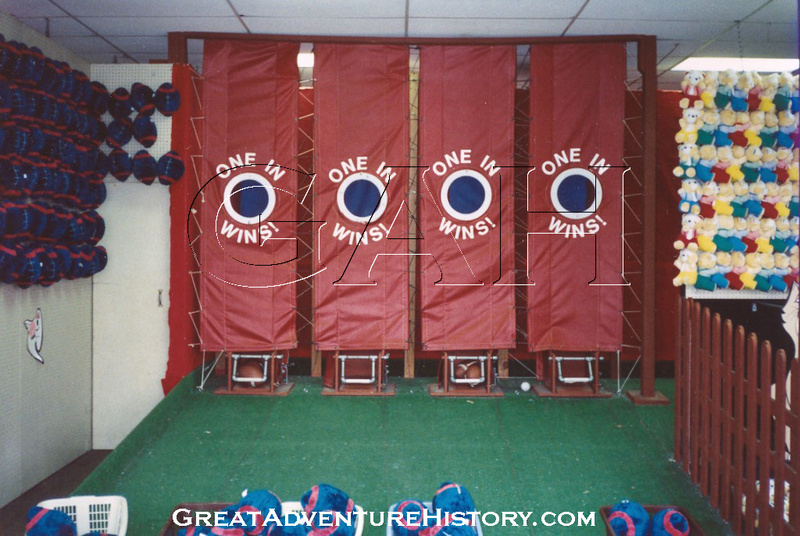 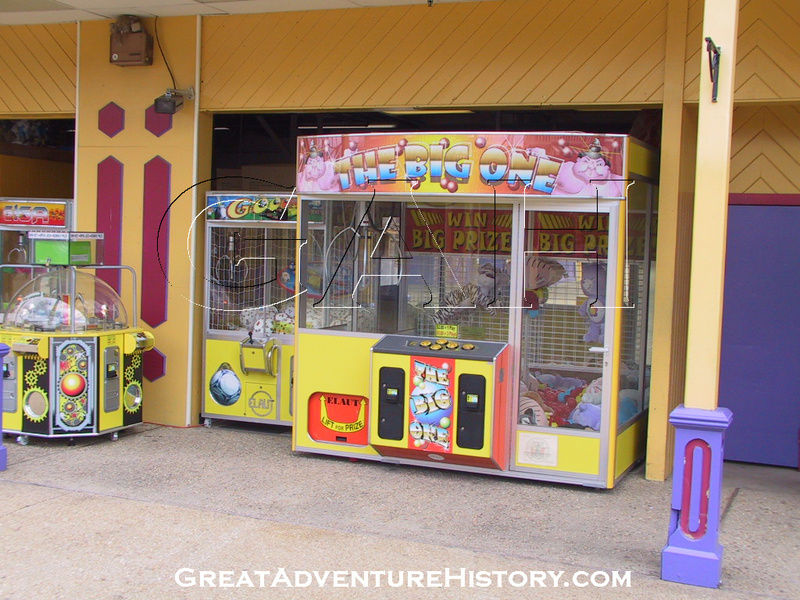 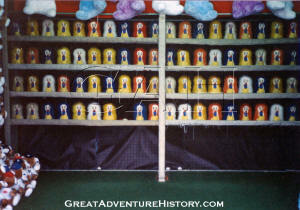 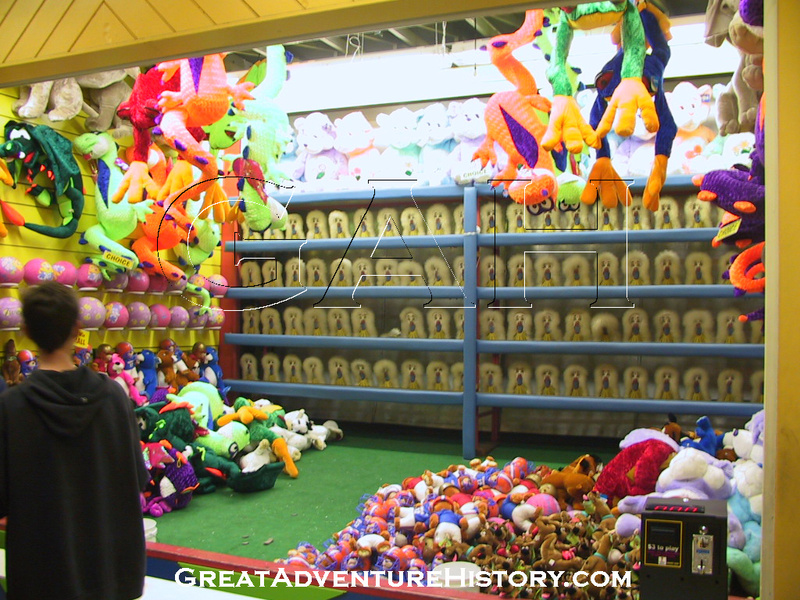 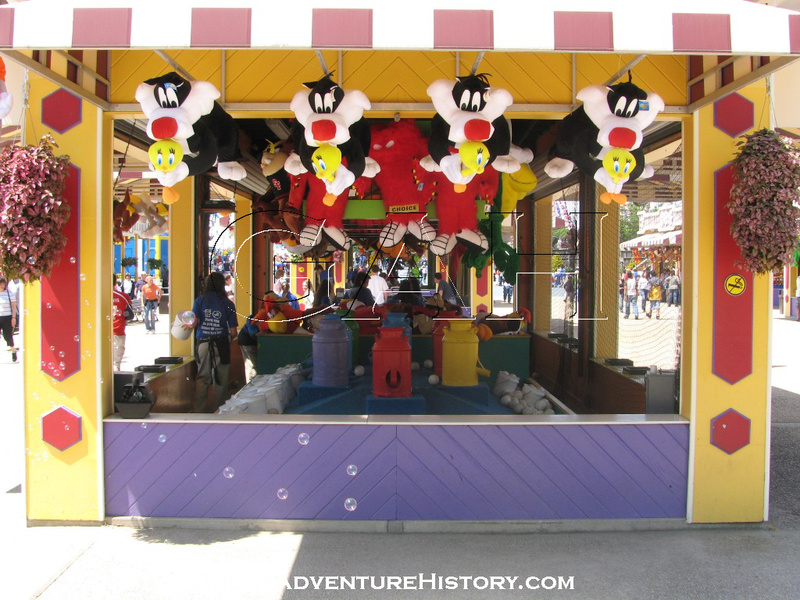 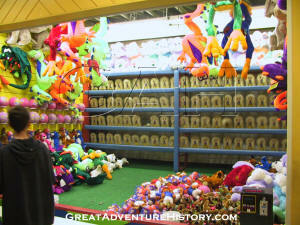 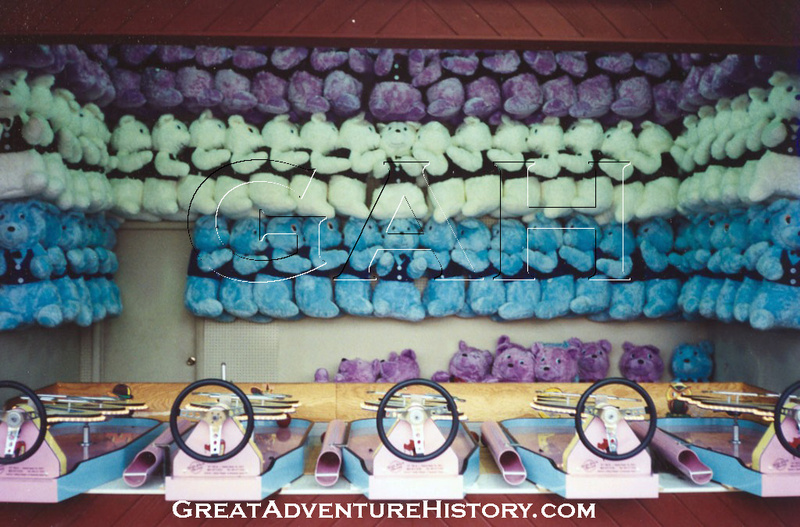 Some of the games which used to sit unused with the roll-down doors shut for days or weeks at a time are used as displays of prizes, adding color and life to what could at times in the past have seemed like a ghost town. With the opening of the pathway to the Golden Kingdom, additional foot traffic comes through the Boardwalk, and an additional game building has been added next to the Twister ride. 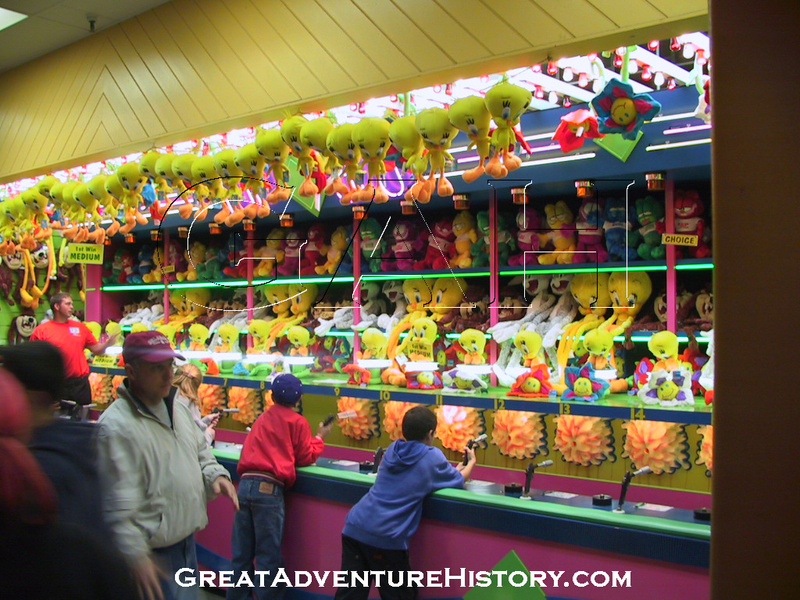 To help alleviate the staff shortages, particularly in the spring and fall, coin operated games have been brought in, and removed as staff levels ramp up for the season. 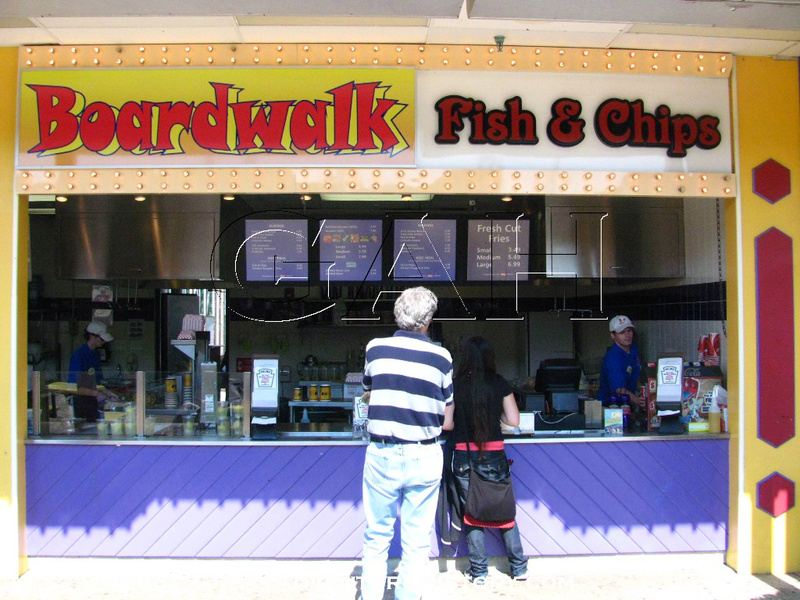 The Boardwalk section of the park truly offers the sights, sounds and smells of a boardwalk, with greasy fried food, a cacophony of sounds, and the bright lights and colors designed to catch the eye of passers by. 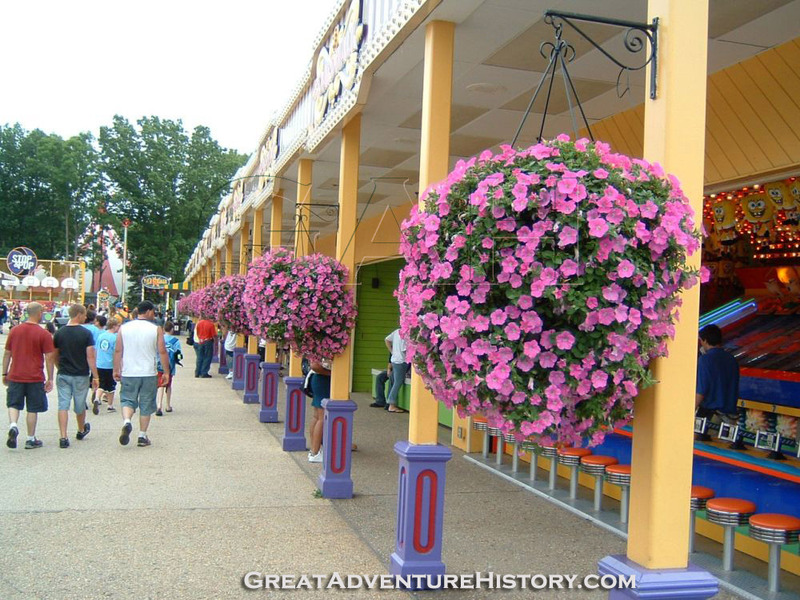 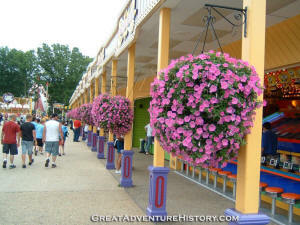 By day, the vibrant colors of the Boardwalk are further enhanced with lush hanging baskets lining the columns. By night, the section comes alive with the thousands of flashing bulbs lighting up the night. 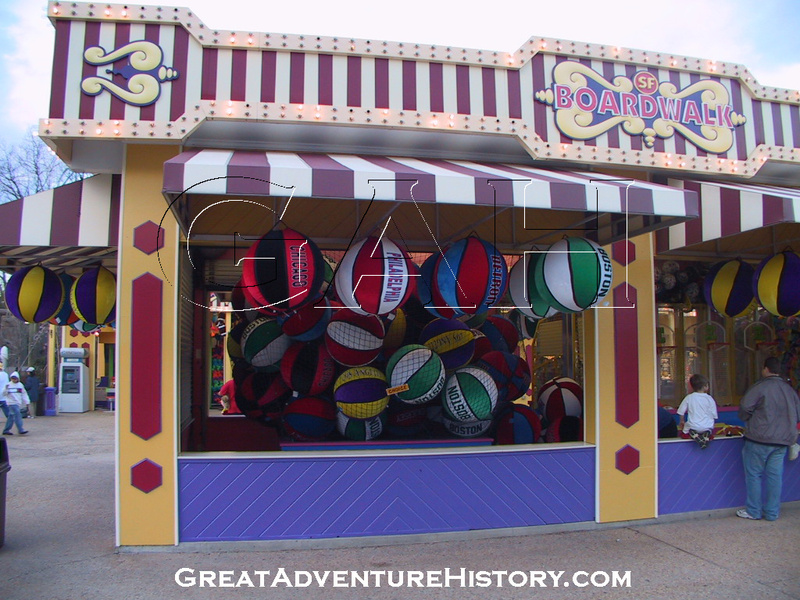 The games of skill at the Four Tents end of the Boardwalk include a basketball game, a high-striker, and the relocated Guess Your Weight booth. 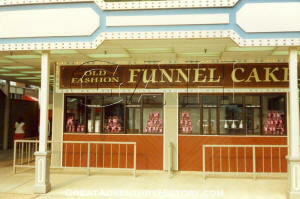 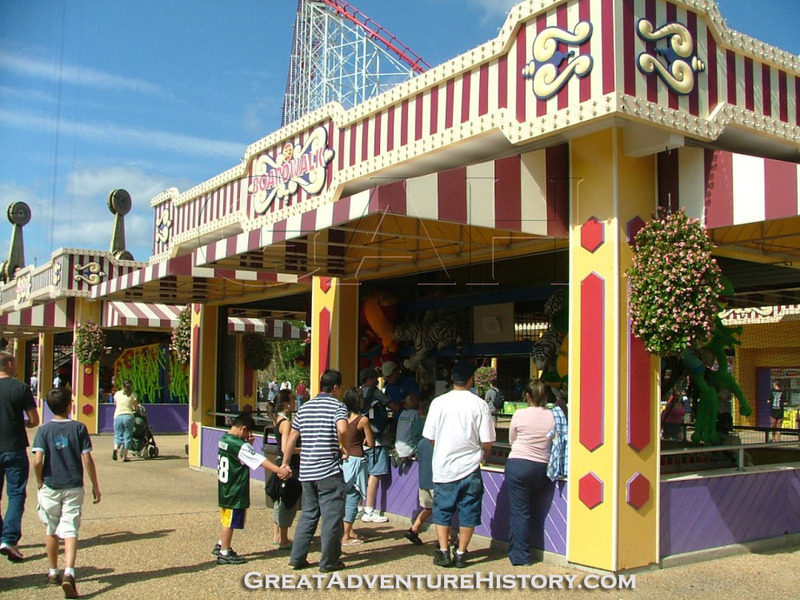 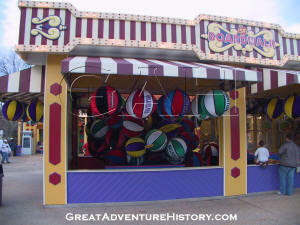 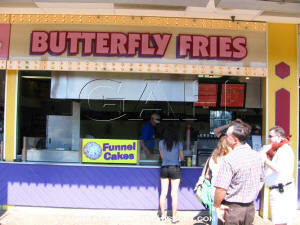 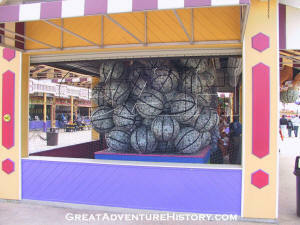 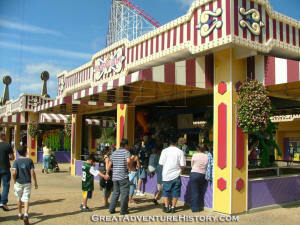 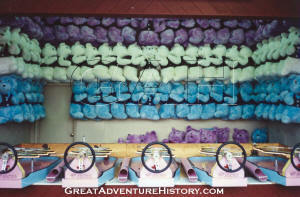 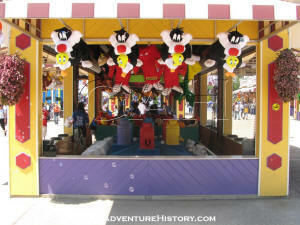 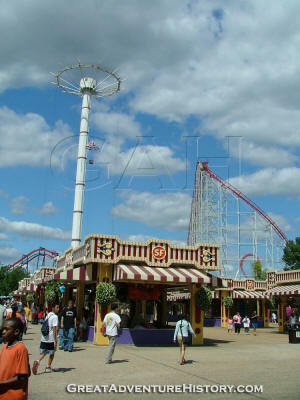 A long time fixture of the area is the cotton candy stand, which over the years has been remodeled and expanded. 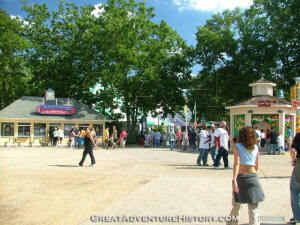 For the 2007 season, it became a Ben & Jerry's Ice Cream stand. 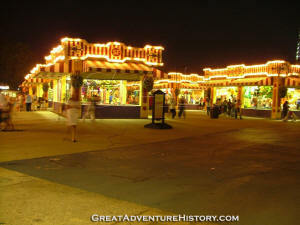 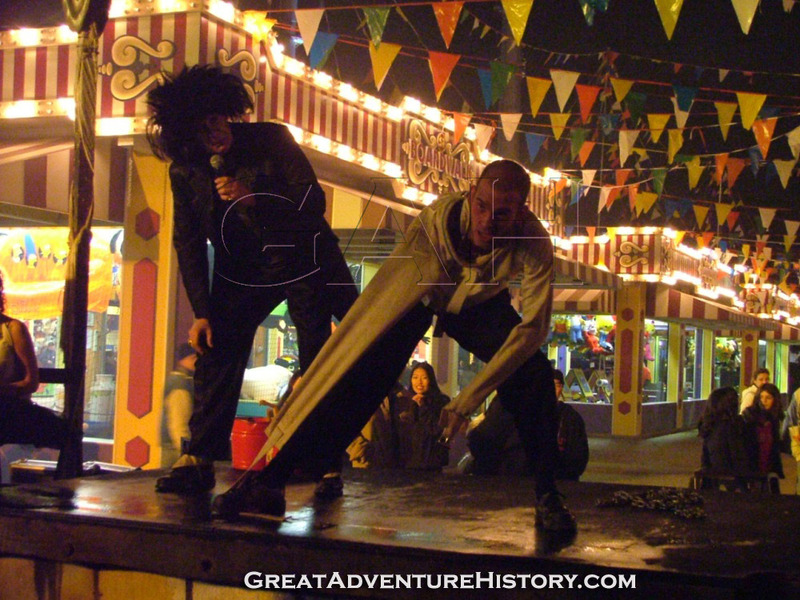 During Fright Fest the Boardwalk area transforms into Circus Psycho, home to side show acts befitting the Boardwalk theme. 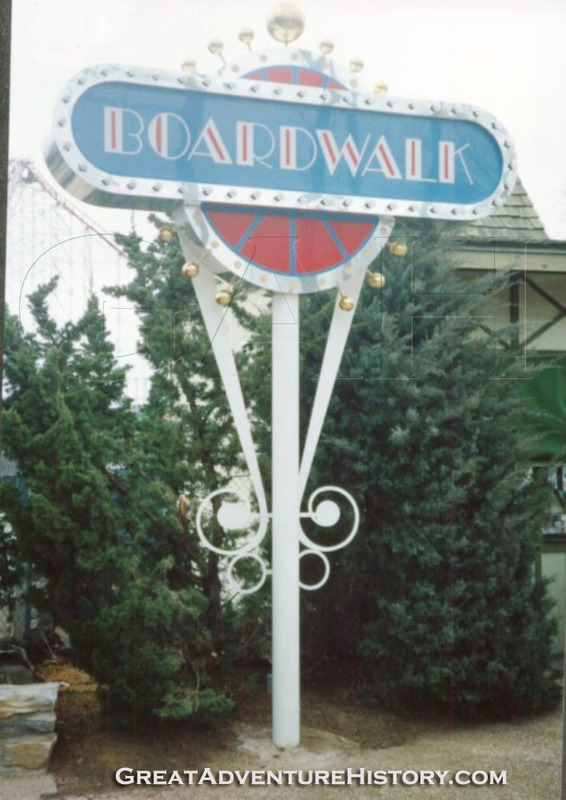 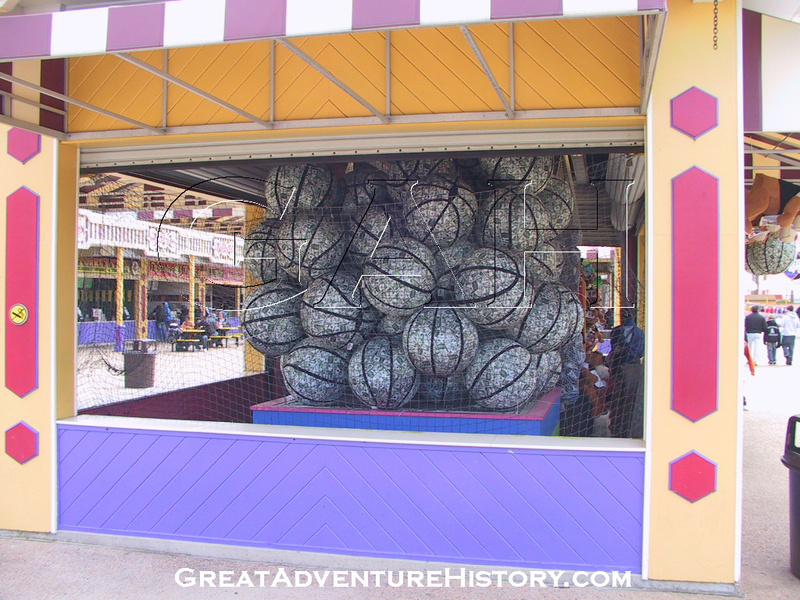 The portals and other set pieces were created to match the colors of the Boardwalk buildings and were introduced in 2001 along with the makeover of the section.